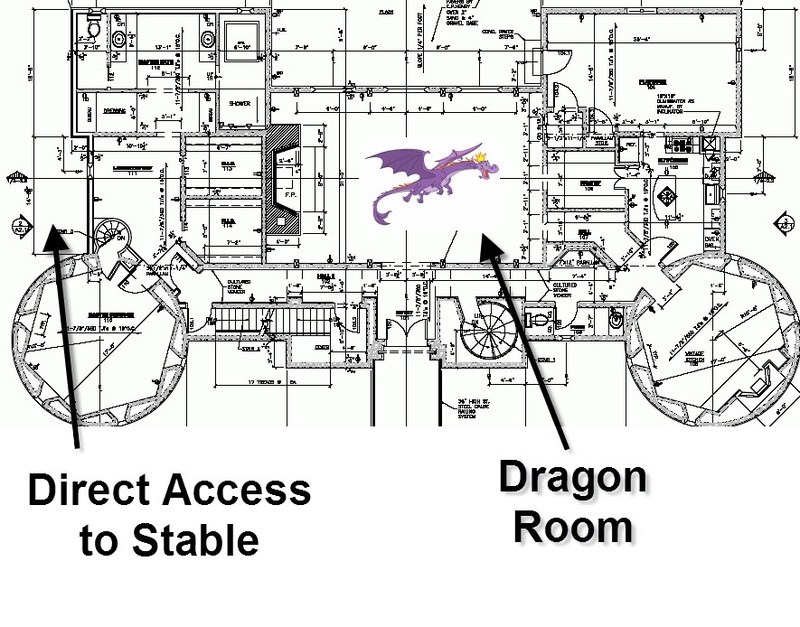 Once upon a time, a powerful, wise and noble maiden worked tirelessly to renovate her castle. She was working hard to install a new floor without having to sell her best milking cow just to afford the materials. 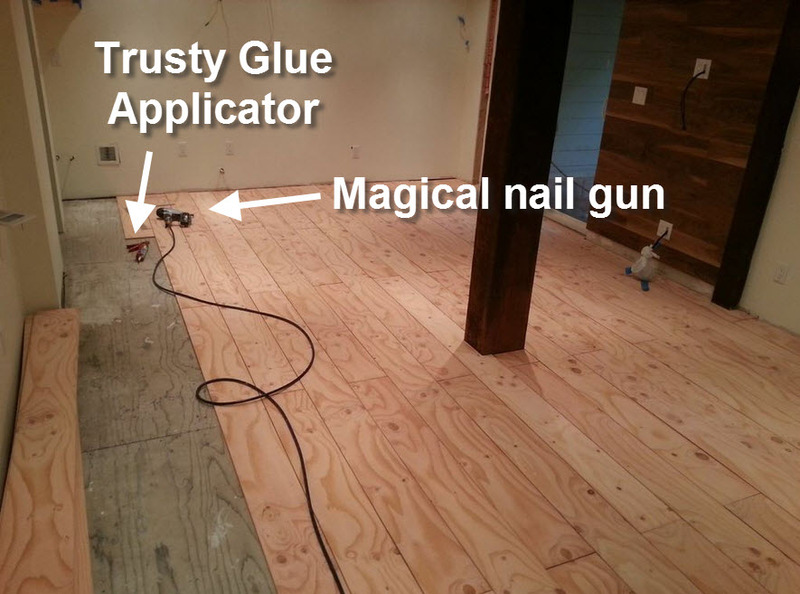 She finally completed the installation of the floor, with the help of her magical wand nail gun, and her trusty forest creatures glue applicator. 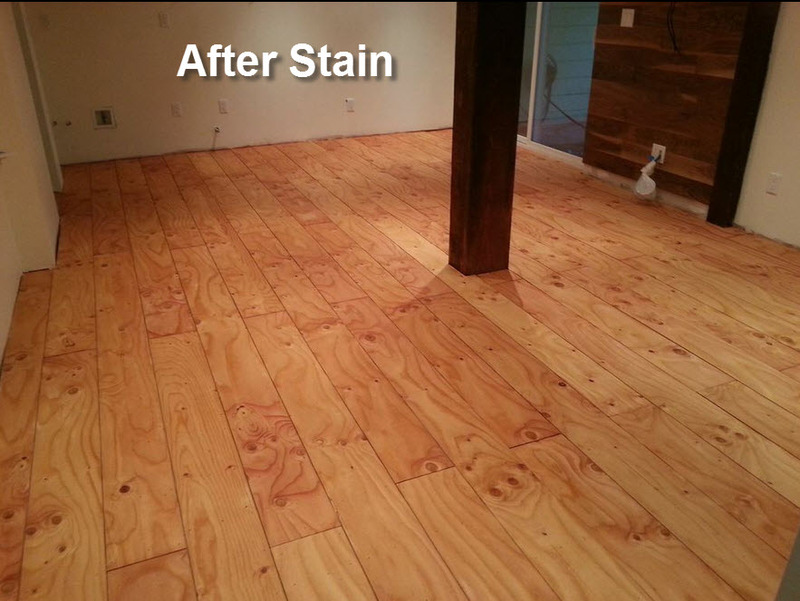 Once the floor was installed it was time to apply the stain. After testing out about 15 different colors the maiden called her creature friends with an announcement. “Hark dear friends, a decision has been made. 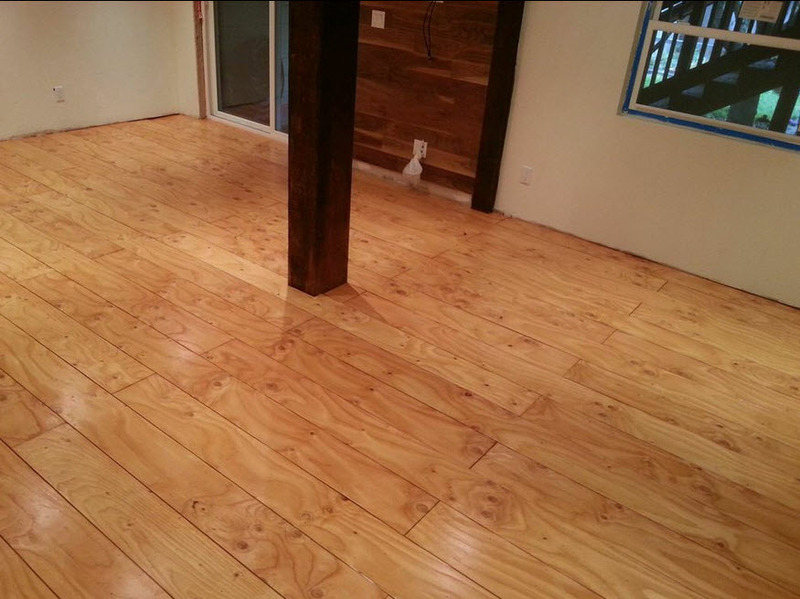 From henceforth, the color of this floor will be known as Honey Maple.” Not wanting to get into the details of what led her to this color, the maiden simply explained that she chose the Zar brand of stain because Minwax and Varathane simply didn’t embody the beautiful hues of nature. 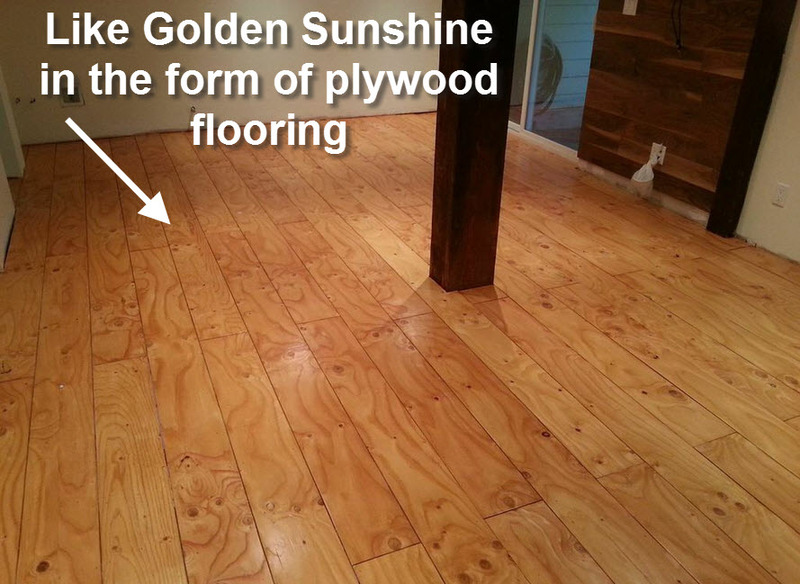 After applying the stain by hand everything was looking just as the stain’s name suggested, like someone had poured honey and maple syrup over the floor, leaving it with a beautiful golden gleam. Things looked so good that the following day the maiden decided to seal in the blemish free wood with a coat of Polyurethane, locking in its youth for all time. She decided to use a water based Polyurethane because it dries so quickly, and because the creatures of the forest (i.e. 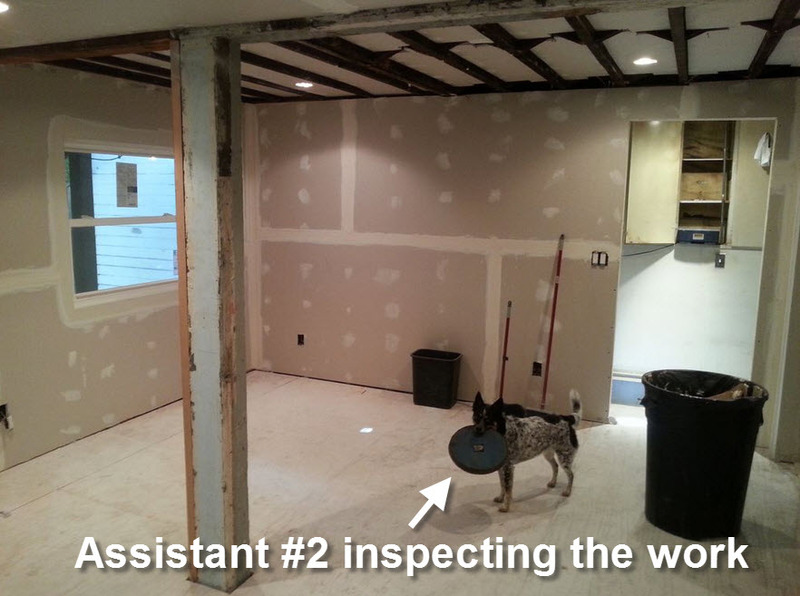 : her dog & cat) could be impacted by the toxic fumes of an oil-based Polyurethane. 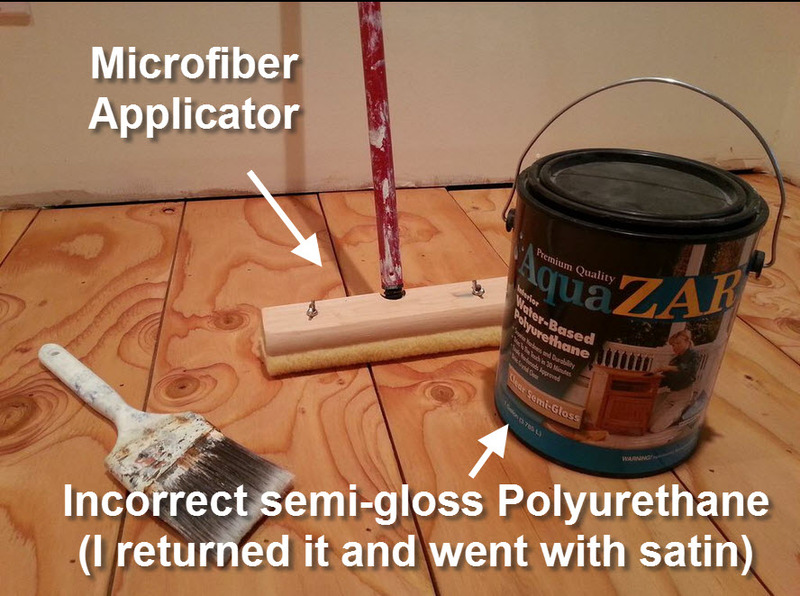 The maiden poured a strip of the Polyurethane (roughly 1” x 24”) directly over her Honey Maple floor and spread it out evenly by pushing and pulling with a microfiber applicator. 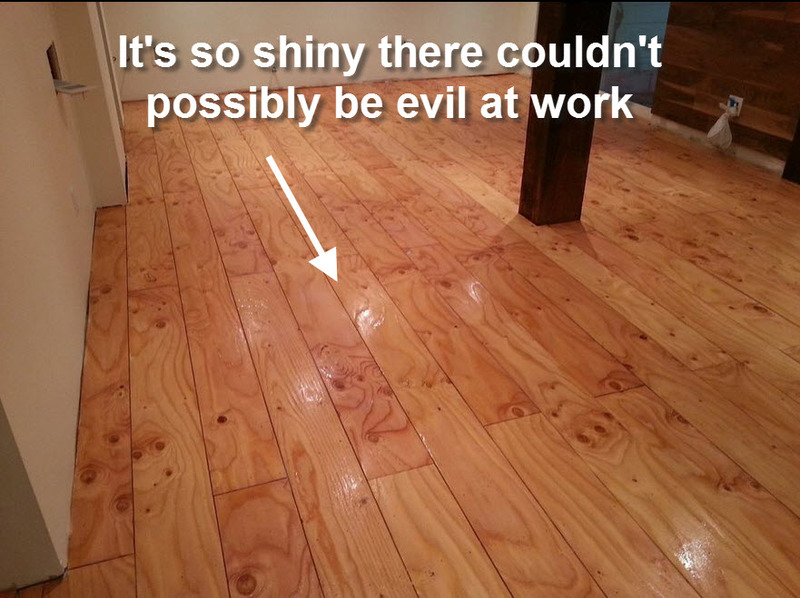 Finally, the floor was covered in the fresh shine of magical protective sealer. Overnight, however, an evil sorceress entered the In Law unit. Threatened by the beauty and glimmer of the floor, she wielded her magical broom and soaked up the stain so that there were huge spots where it didn’t even look as if stain was applied. Cackling with satisfaction, she then covered over her handiwork with the polyurethane and fled to torment another unsuspecting DIY’er. The next morning, the maiden headed down to her In Law unit, whistling a happy tune, when she stopped, stunned and terrified by the sight before her! SPLOTCHES! Everywhere! She had no idea how this had happened but suspected that evil was afoot. What else could explain…this!? The maiden, being more powerful than the cackling witch had assumed, pulled up her Cartharts and went right to Google. She typed and clicked and read and watched until the answer came to her. 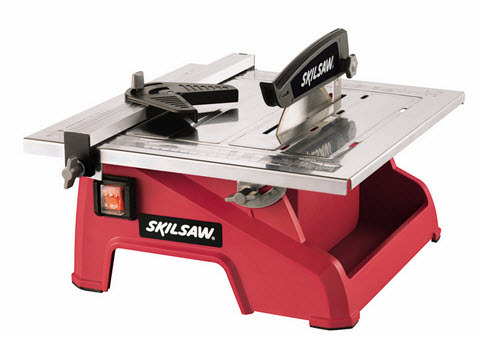 “Softwood” the Google machine whispered to her…blame softwood. After promptly slamming closed her laptop, cursing the Google machine and its all knowingness, the maiden went back to work. 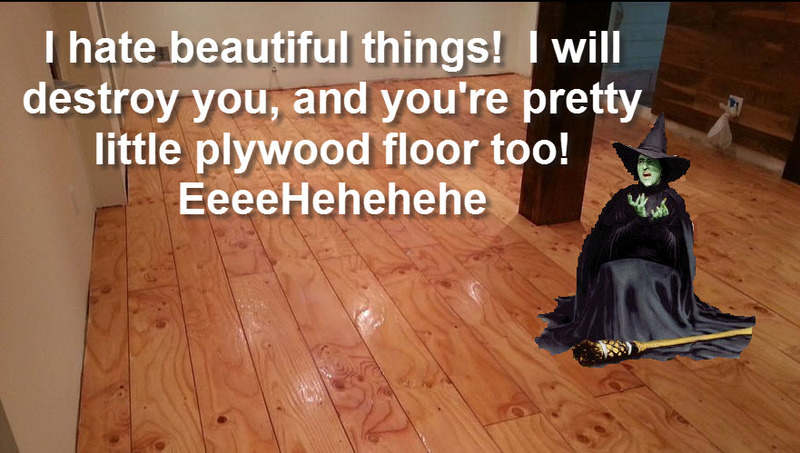 In her rush to fix the problem bestowed upon her by the evil sorceress, the maiden rented a floor buffer to try and take the layer of Polyurethane off. Unfortunately for her, the floor buffer was possessed and merrily threw her around the room like a doll. 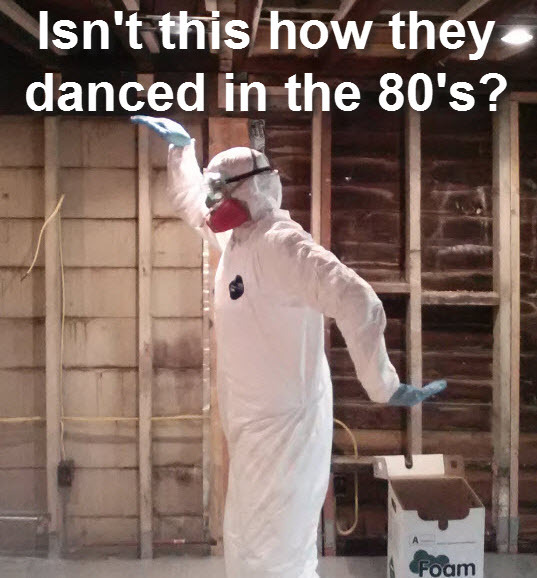 While she did get free dancing lessons from the possessed beast, the polyurethane remained in place. The maiden then went to her trusty palm sander. After sanding her way through the protective layer, she applied around 4 more coats of stain over the many unstained spots. 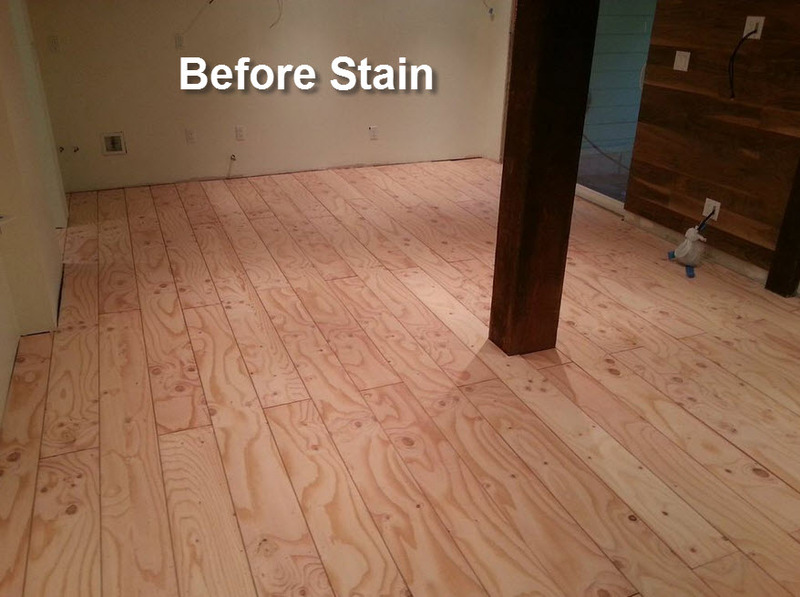 The reason for the extra coats was because the stain just didn’t want to soak into those spots. 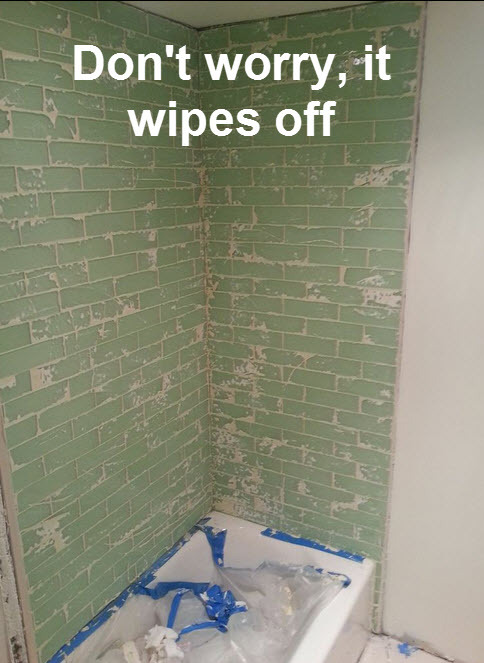 Whatever evil magic that prevented the stain from sticking before, was still an issue when trying to reapply. 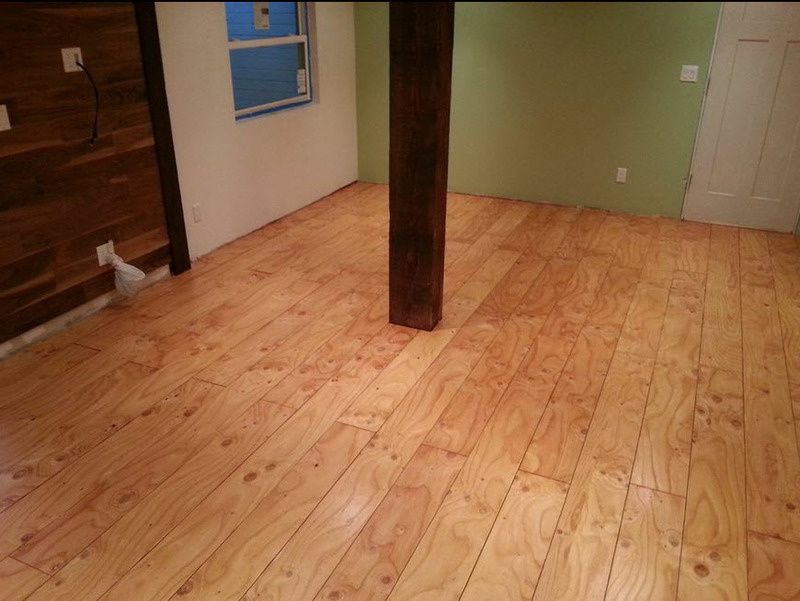 Finally, after the final application of stain, the maiden’s floor had been evened out. 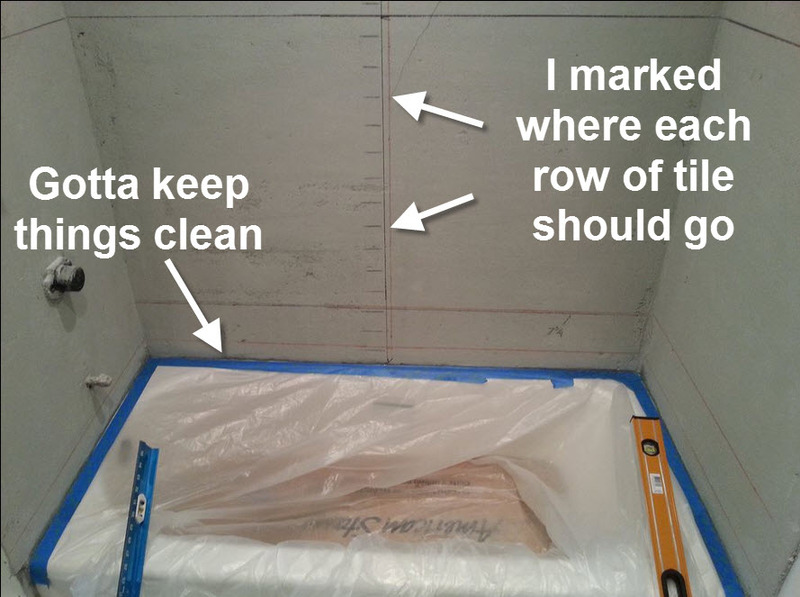 After a solid vacuuming, then using a tack cloth to get up the remaining dust, she returned to applying Polyurethane. This time, when the sealer dried the floor had the sparkle of honey, just as she had wanted. 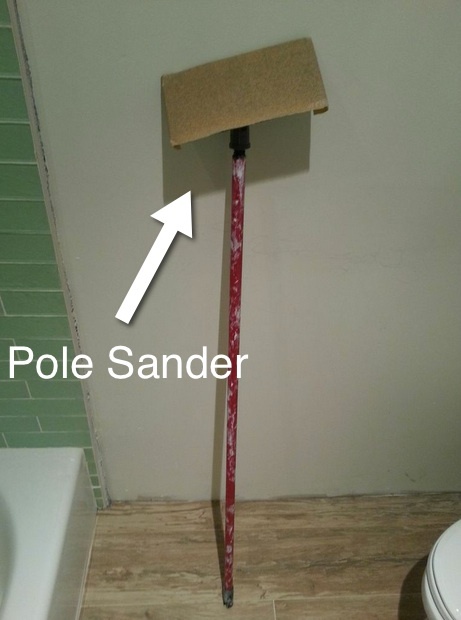 Rather than bringing back the possessed buffer, she decided to use a pole sander and 180 grit sand paper to get rid of the bumps between layers of Poly. 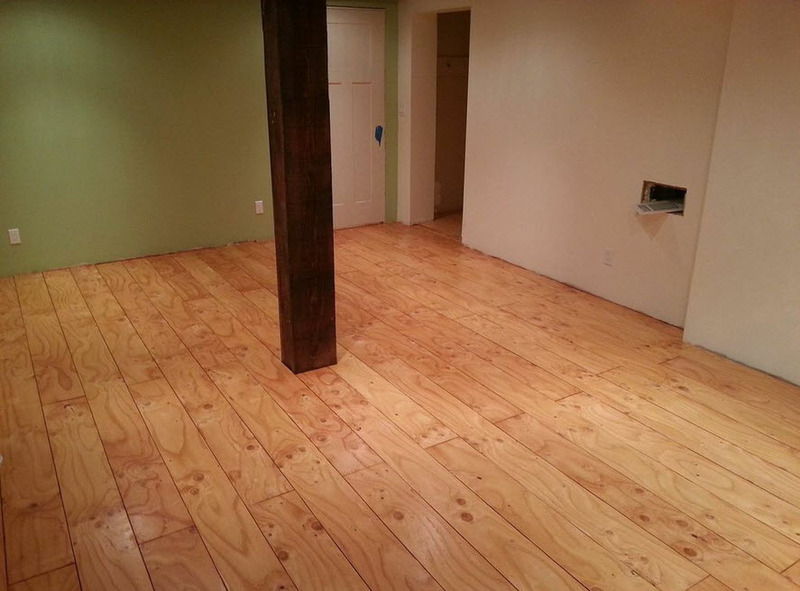 Finally, 3 coats of Polyurethane later, the powerful maiden was able to call her new floor complete! Hi Everyone! You may be wondering what I’ve been up since my last post. Now that the bathroom is nearly done, I’ve returned to the main living space of the In Law unit. 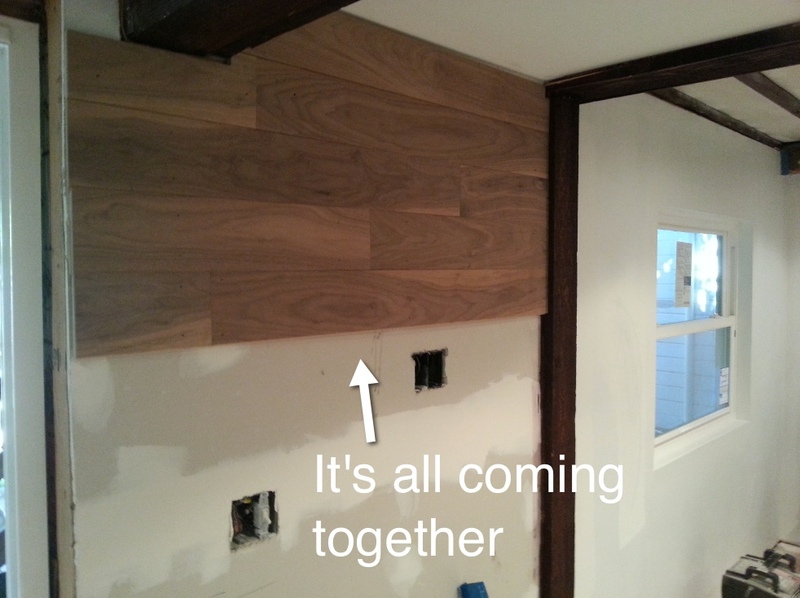 Before I can install the kitchen and the crown/floor moldings I need to install the floor. 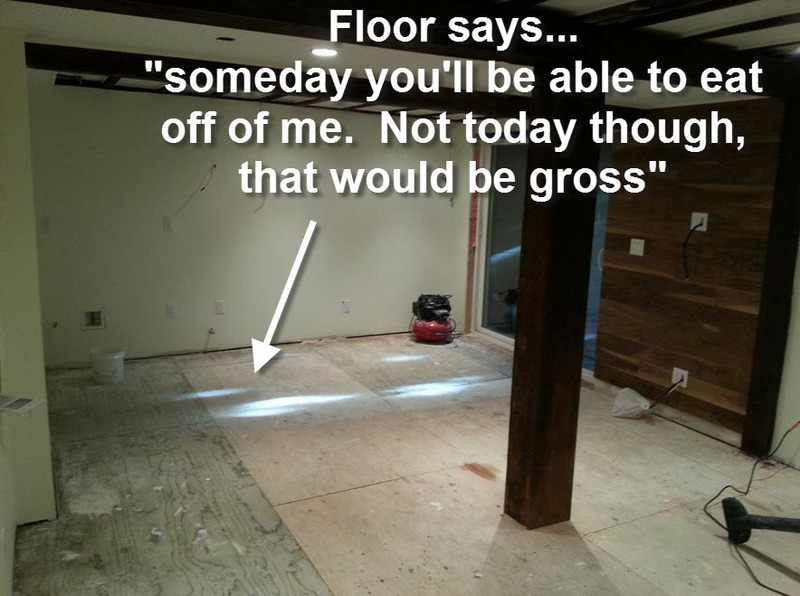 Now, with that said, I do not want to spend a fortune on flooring. In fact, I want to do the opposite. 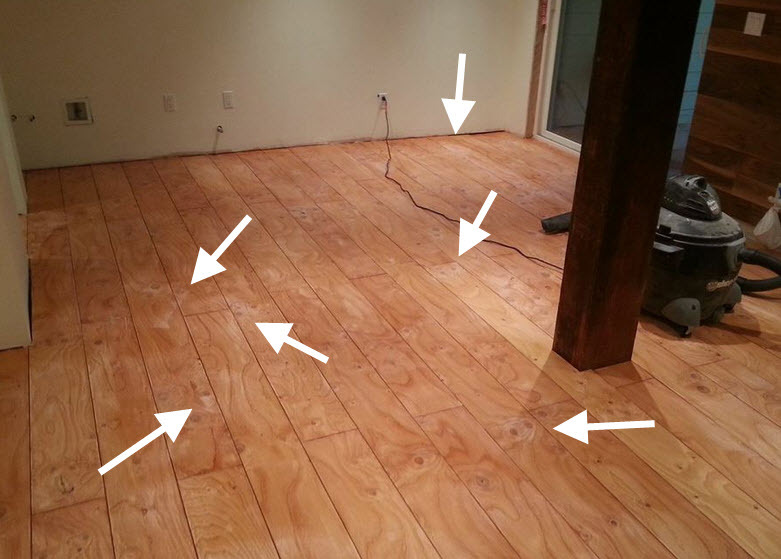 Unfortunately, real hardwood flooring can be upwards of $6 a square foot, which could cost me over $2000. Since my budget was closer to the $400 range, I had to get creative. Finally, it came to me! 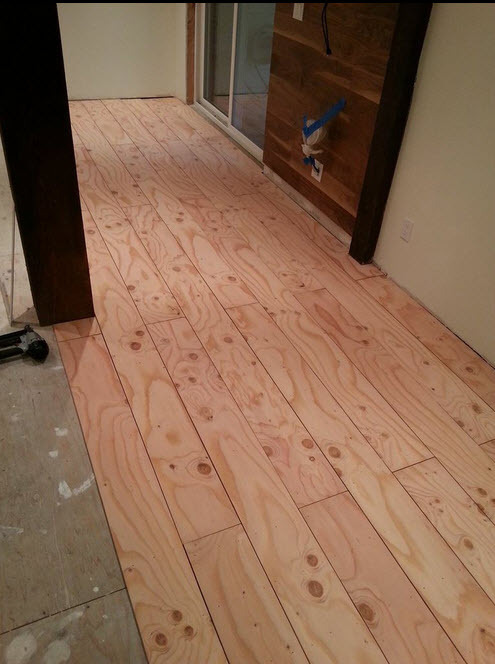 Forget about hardwood, engineered or laminate flooring. 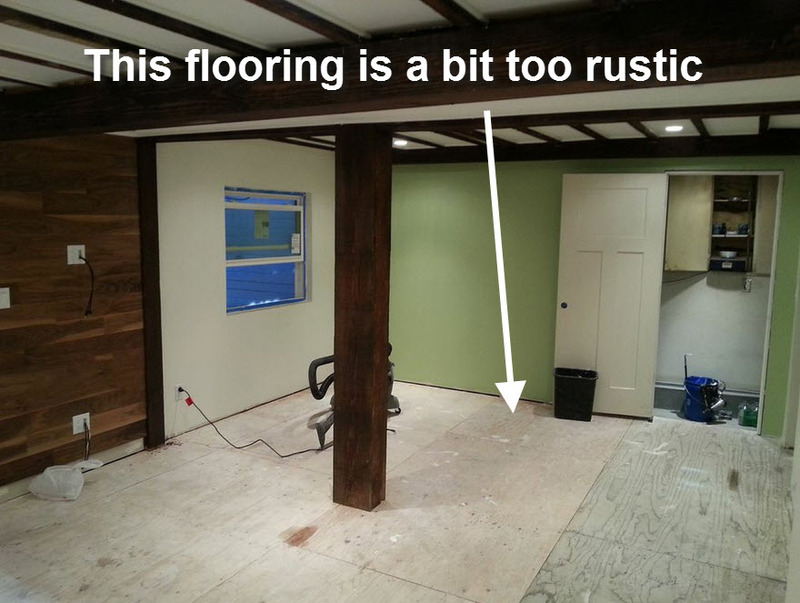 Forget about tile and carpet (there’s nothing rustic about carpet…or if there is I don’t want to go near it). 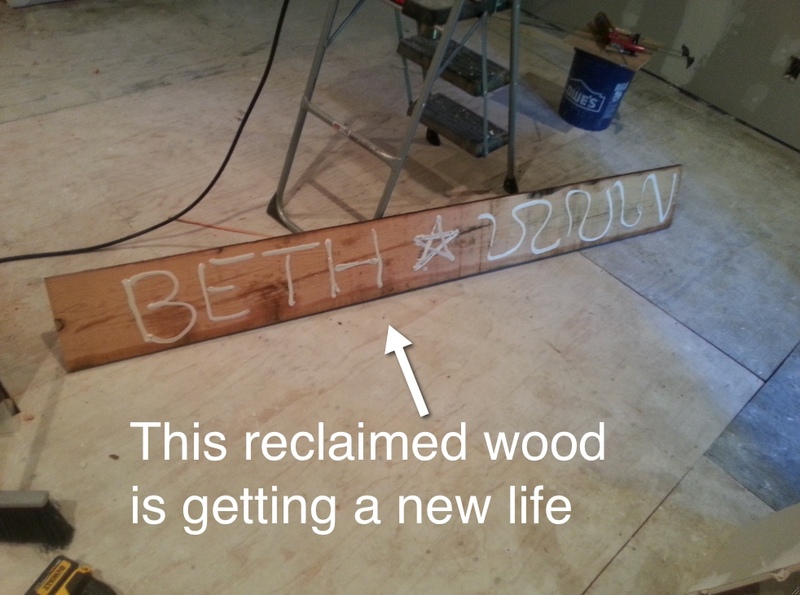 Instead, picture it…plywood. 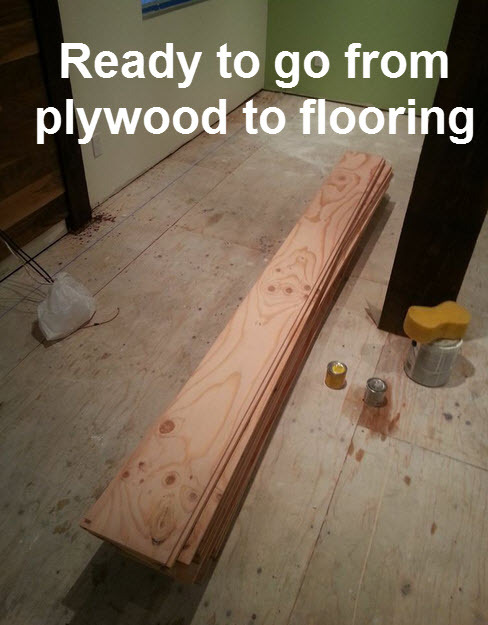 That’s right people, we’re going to use plywood! 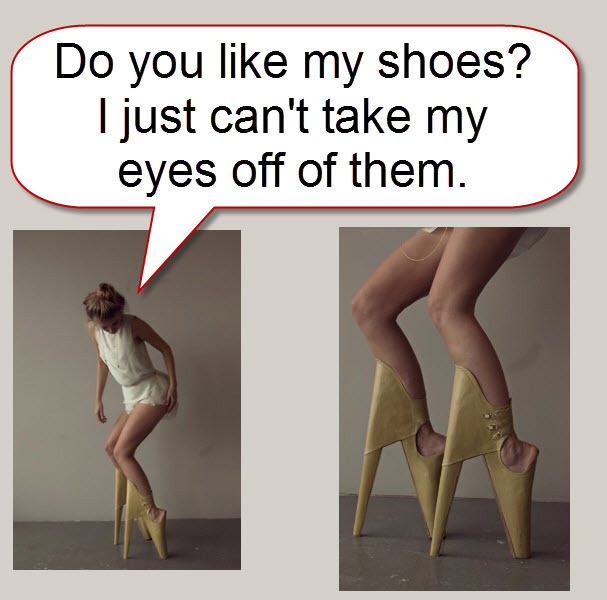 I know what you’re thinking… “Plywood? Really? 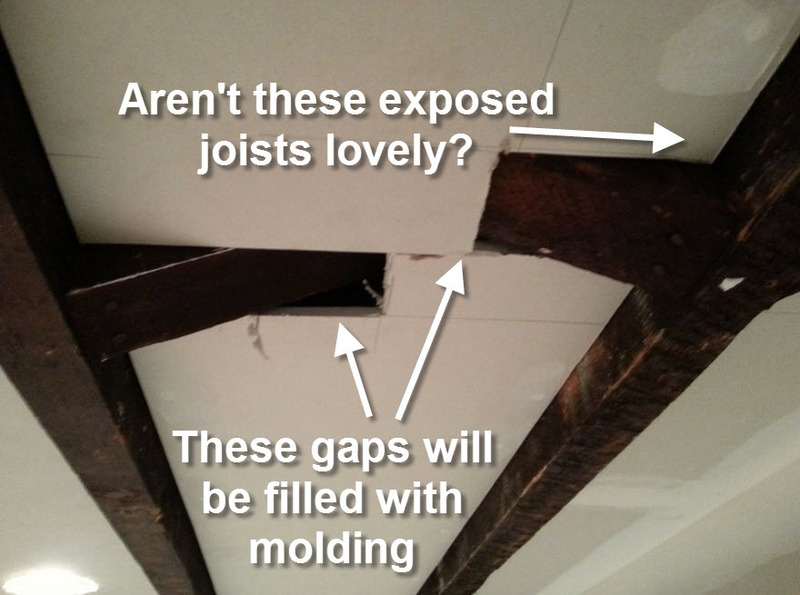 You’re just going to nail sheets of splintery, rough, knotty wood to the floor?” No, my loyal reader…of course not! Would you expect me to get dressed up in my finest threads and then wear, well, something like this? 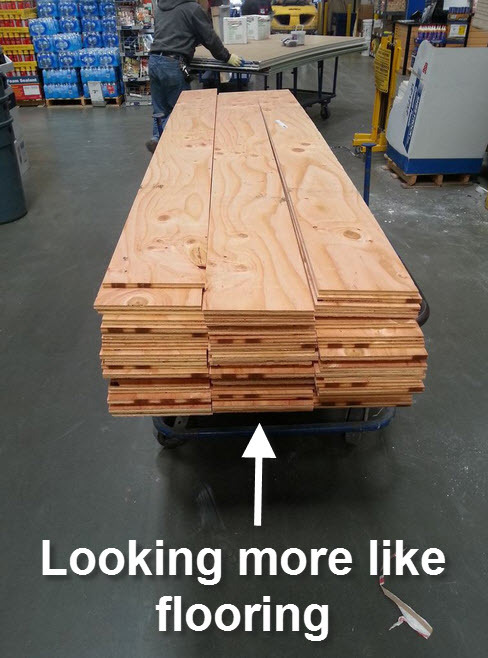 First, I went to Lowes and purchase around 14 sheets of 4’x8’ knotty pine plywood. 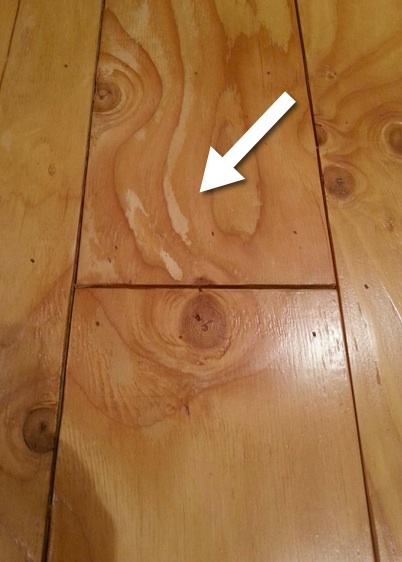 We’re talking about their low-cost plywood, not their fancy maple plywood. Once I had all of my sheets ready to go, I paid Lowes to cut them into 8” strips. 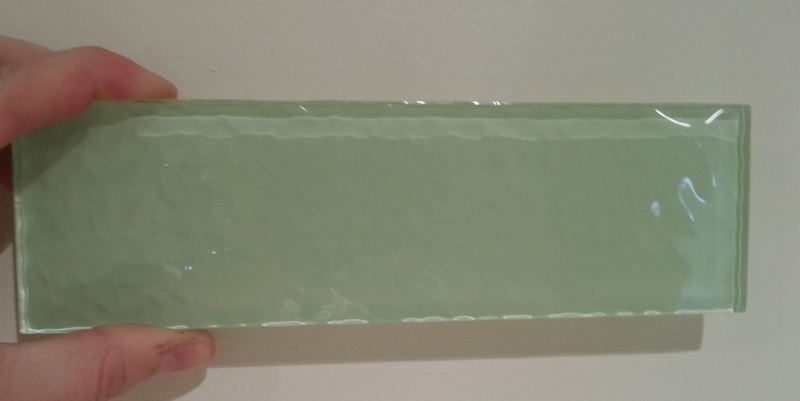 By cutting them into 8″ strips, I’m able to get a nice even number of strips from each sheet, thus reducing waste. While I do have a table saw at home, trying to cut the sheets into even strips would have been very difficult. Also, it only cost $.15 per cut, leaving me with a cost of around $15 for everything. 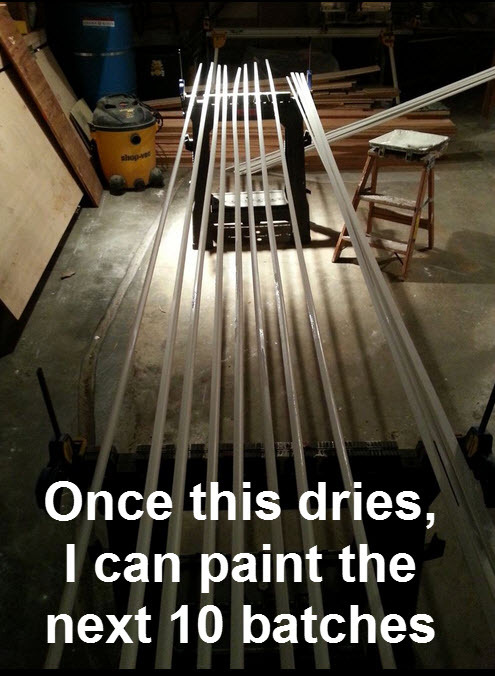 Now that all of my plywood has been cut into strips, it’s time to go home and begin sanding…and sanding…and sanding! 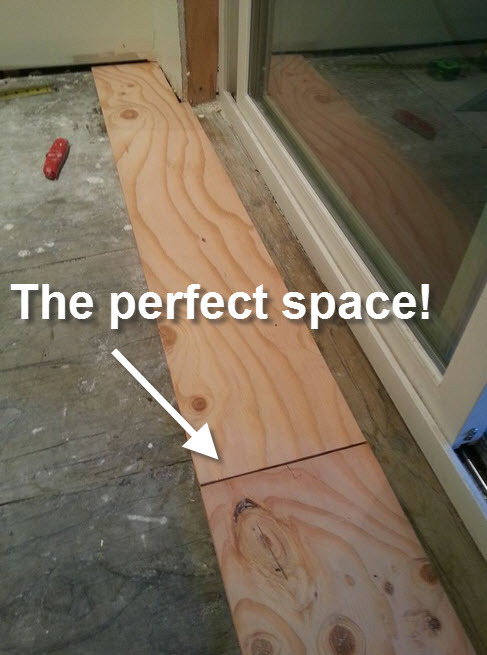 While the lower grade plywood is cheap and rustic looking, it also has a ton of splinters. Since I don’t want my guests to get splinters in their feet, I tried to sand all of the pokey bits completely smooth. 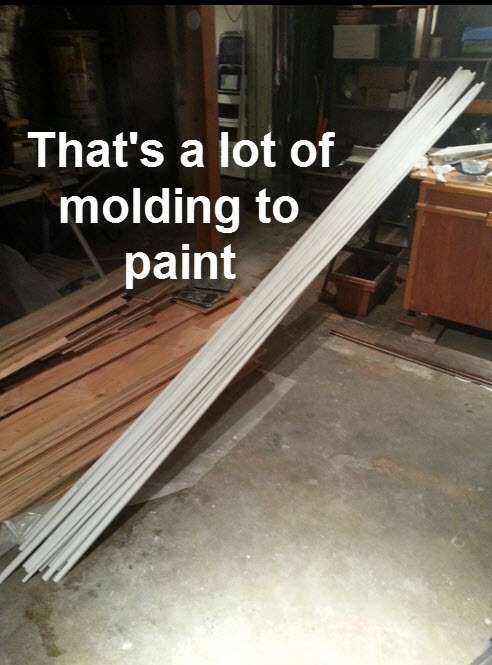 Finally, after many (MANY) weekends of sanding, I have officially gotten through ALL of the plywood strips. 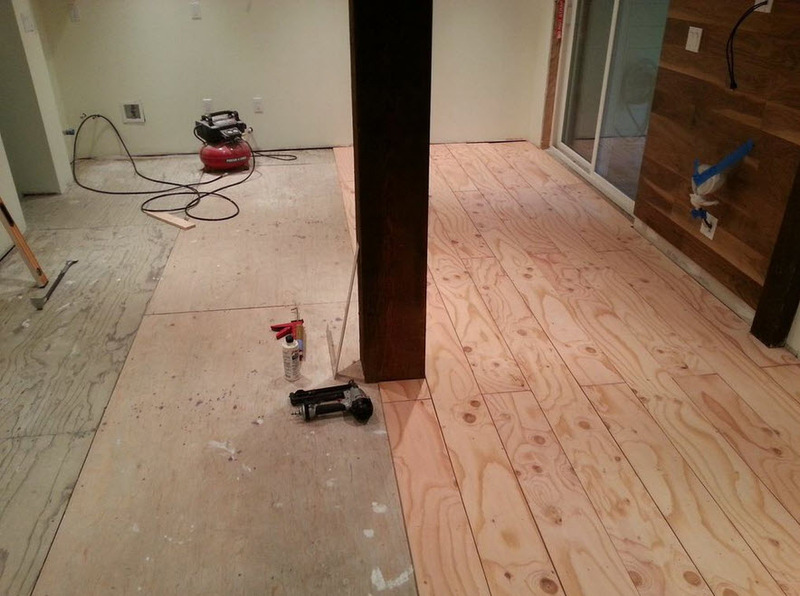 Now it is time to start laying the flooring. 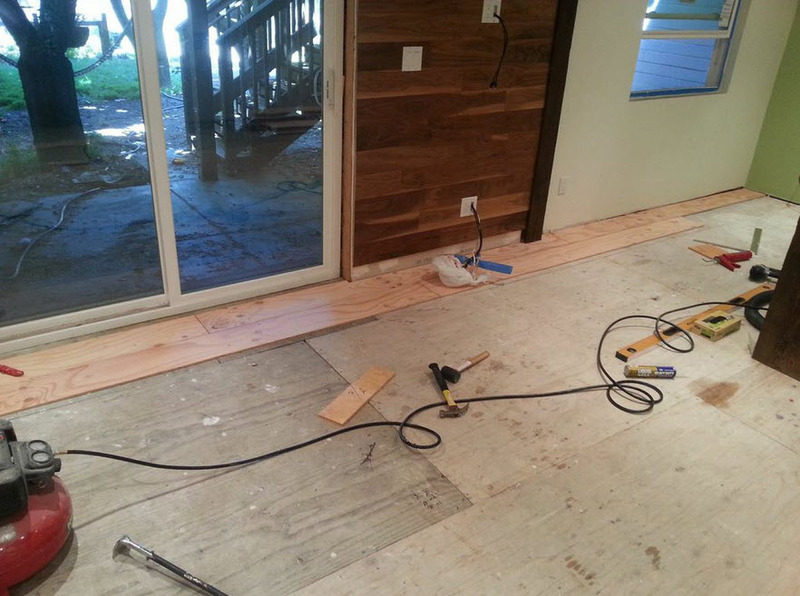 Since I’m going for that rustic, barn wood look, I am simply going to glue and then face nail the strips of plywood to the floor. 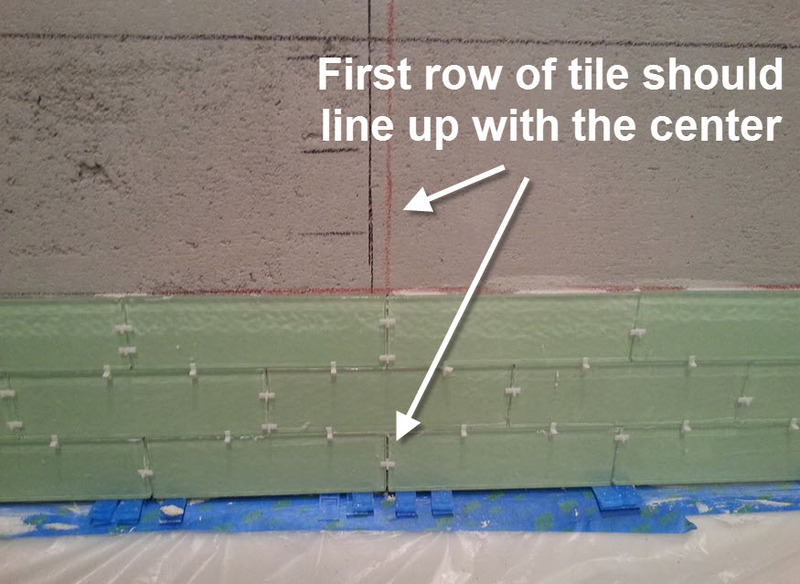 I begin by marking the position of the first row of flooring. 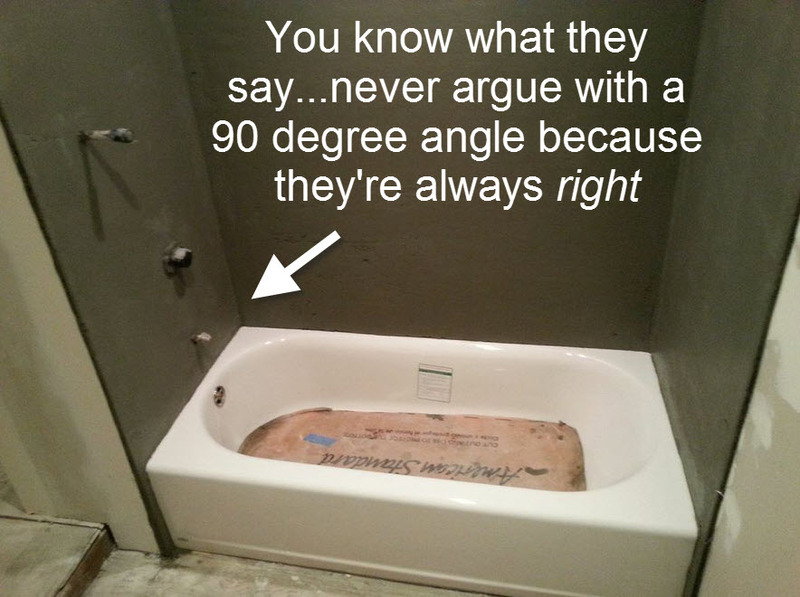 This is really important, otherwise by the time you get to the other side of the room your flooring could be crooked. 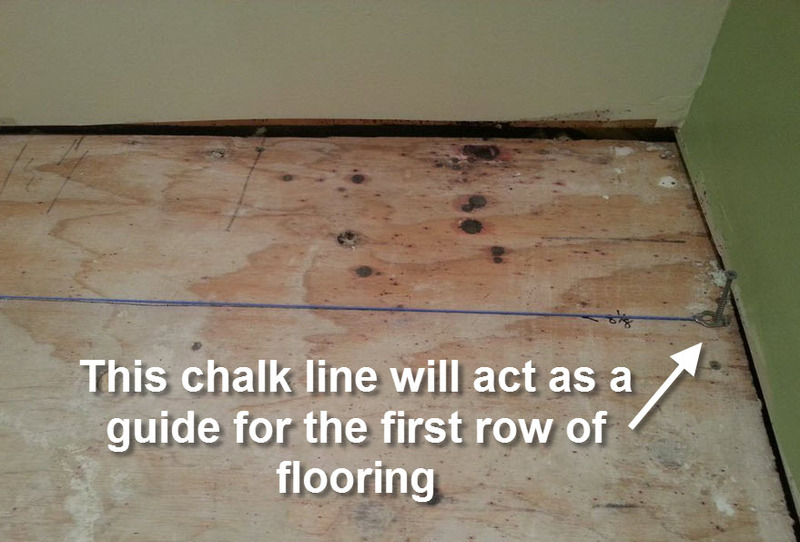 Once the line is marked I began to install the flooring. 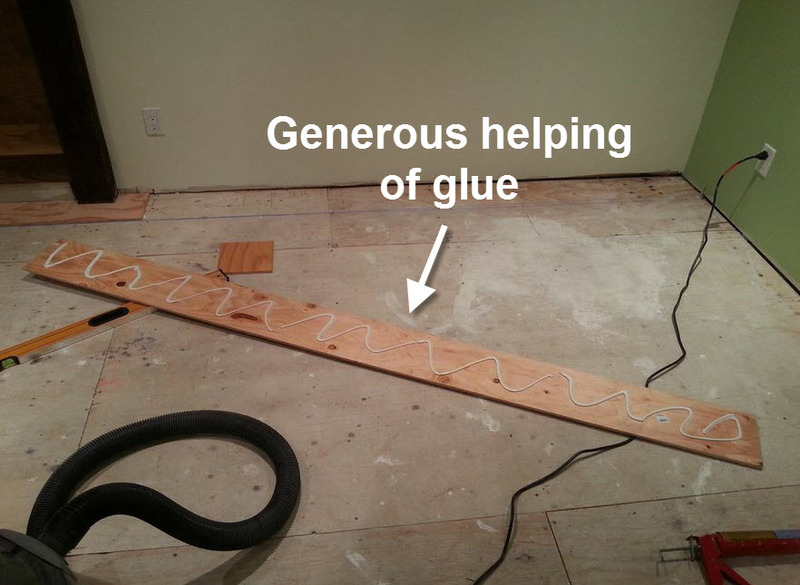 I first put a generous amount of heavy-duty construction adhesive on the back of the plywood. 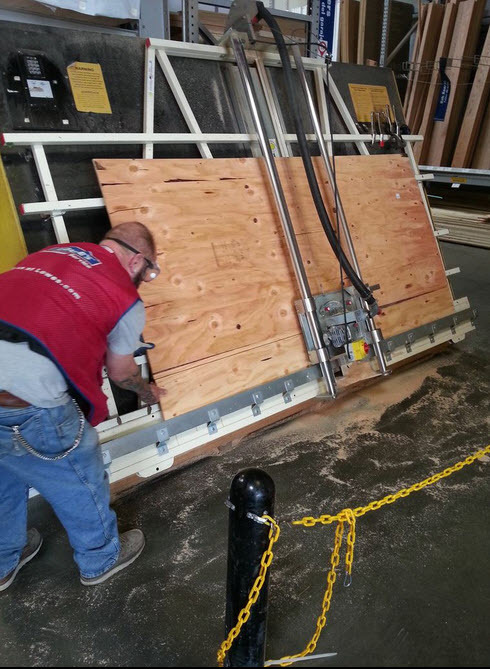 I then put it down in position and used my finishing nailer with 16 gauge nails to shoot 3 nails into the board every 6 inches. 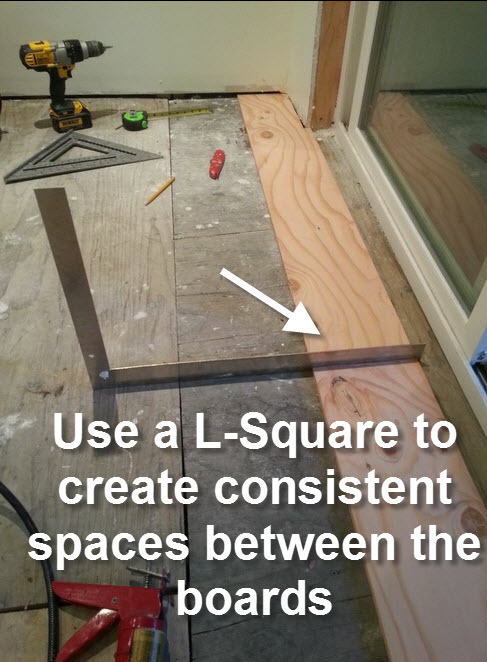 In order to properly space the boards I used my L-Square, which was the perfect width for me to use to separate the flooring strips. 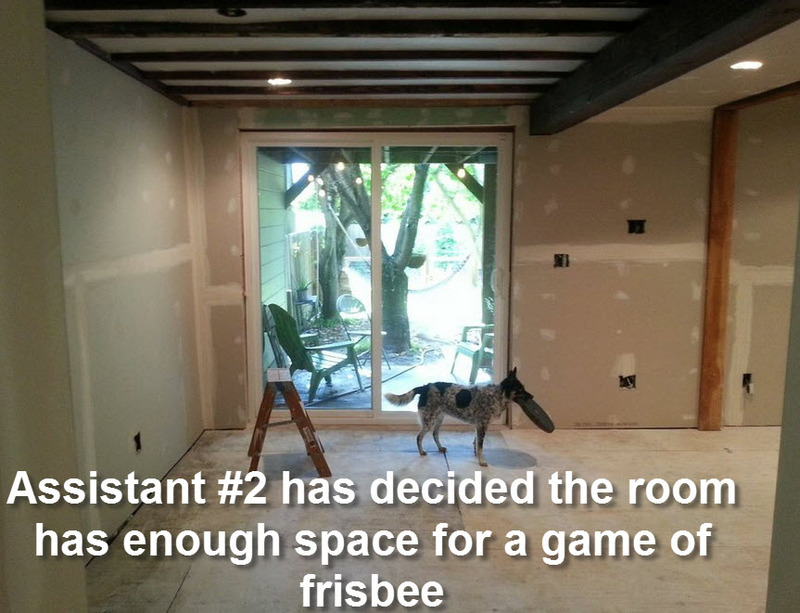 Now, continue to do that until the floor is finished. I’m half way there! 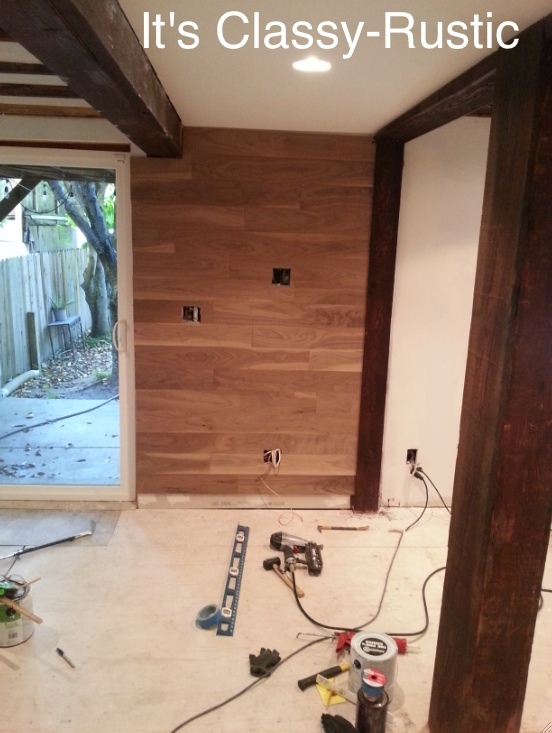 My next post will cover the second half of the flooring, along with staining and sealing. Stay Tuned! 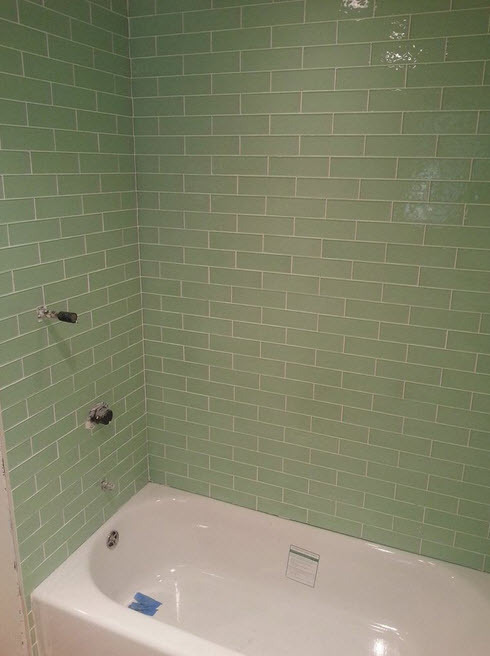 Last time I posted I showed you the brand new tile surrounding the bathroom tub! It makes me smile every time I see it! Of course, while everything is coming together, this puzzle has a few more pieces. Take for instance the floor. 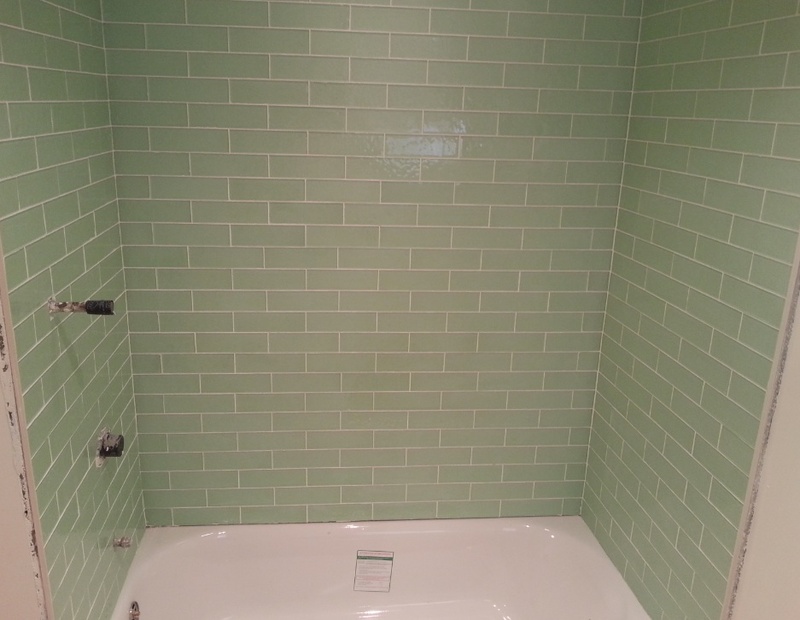 One major lesson I learned while tiling the tub surround was that the smaller the tile, the longer and more tedious the project is going to be. 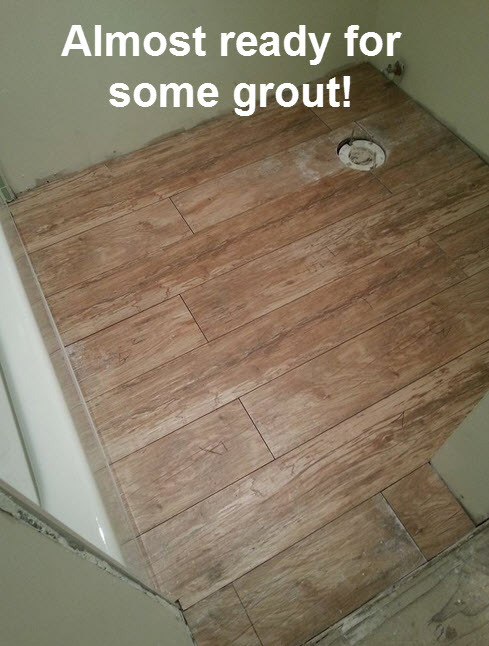 With this newfound knowledge at my finger tips, I decided to go the opposite direction with the floor tile. 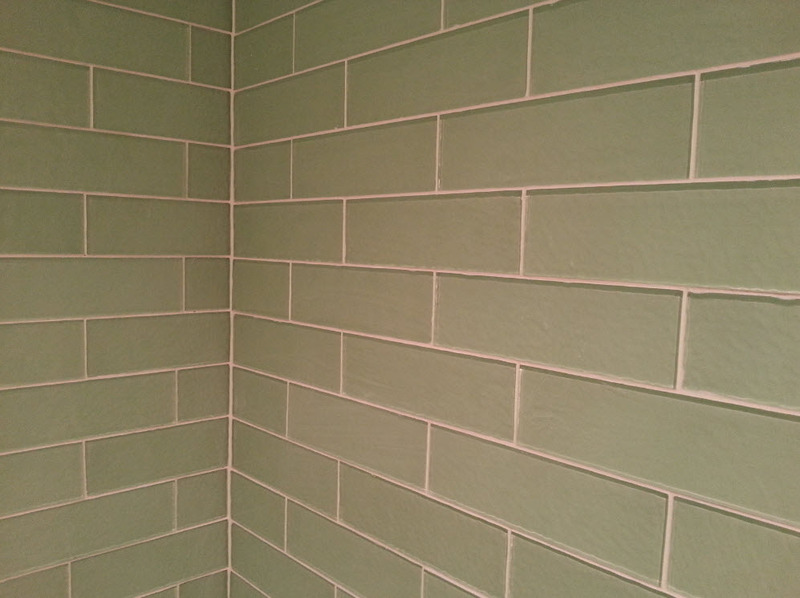 No more pocket-sized tile. This time, I went unwieldy, heavy and long! Now, imagine feeding a one ton piece of tile that is as long as a small tree into that flimsy plastic contraption and you’ll understand the risk I was taking. 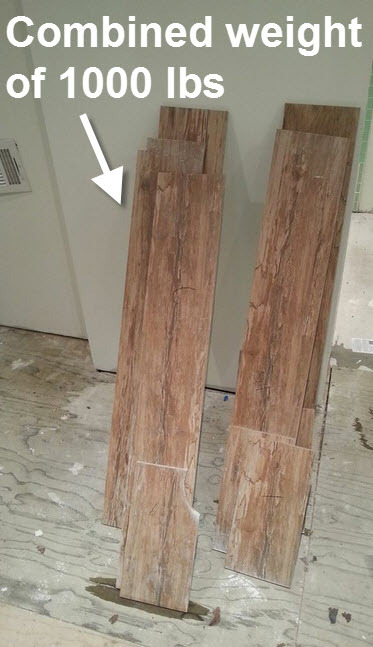 I pre-cut all of the planks of floor tile so I could lay them all down in fell one swoop. 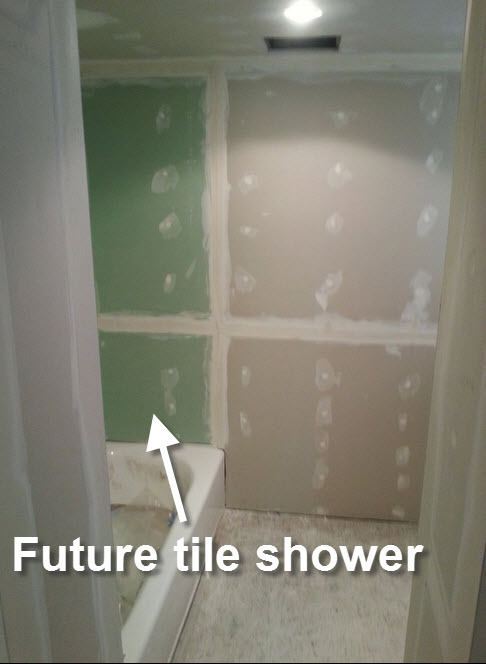 I also ‘dry fit’ the tile prior to mixing the mortar to make sure everything fit together well. 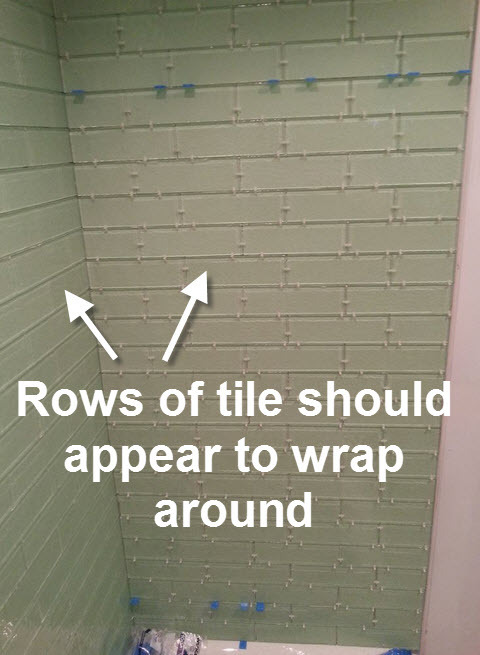 The process of laying the floor tile was essentially the same as the wall tile, but I didn’t need to constantly check that the tiles were level. Everything ended up going down really quickly. 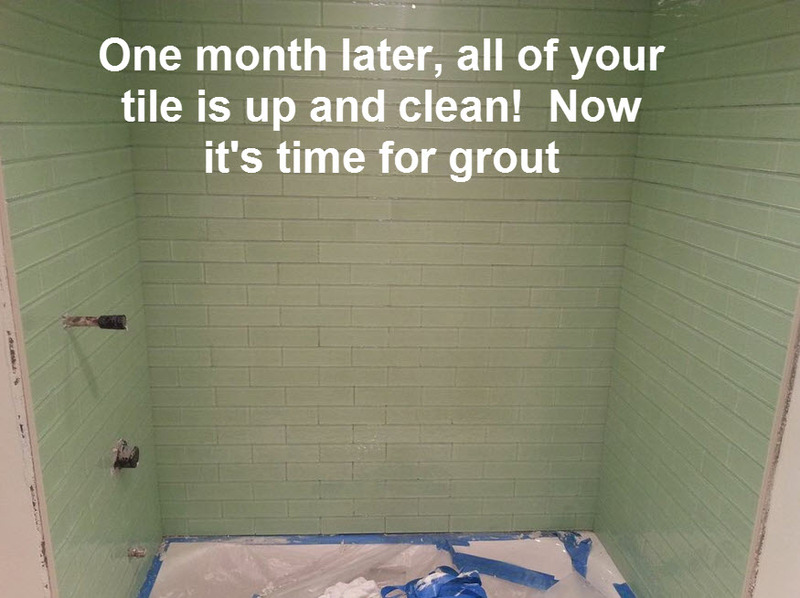 Once the mortar dried it was time for the grout. 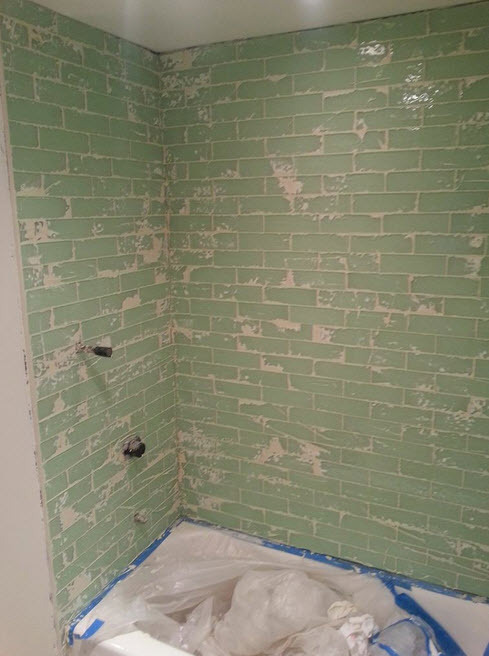 Just as I did with the wall of tile, I saved some of the wet grout to do some touching up after the first layer dried (about 20 minutes later). Now, you might think that this was enough for one blog post, but no! 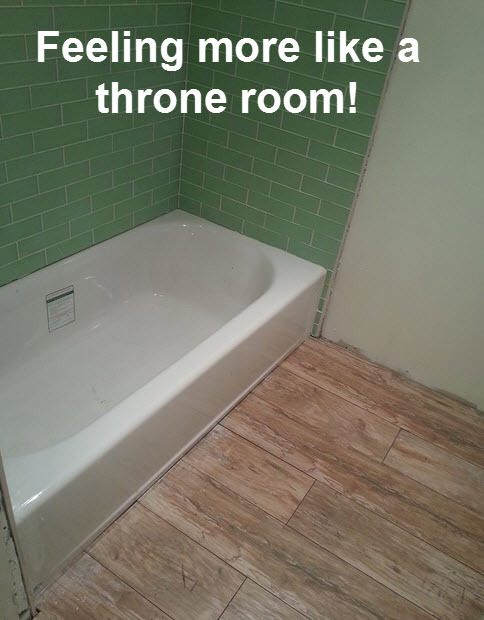 After all, what is a throne room without a throne? 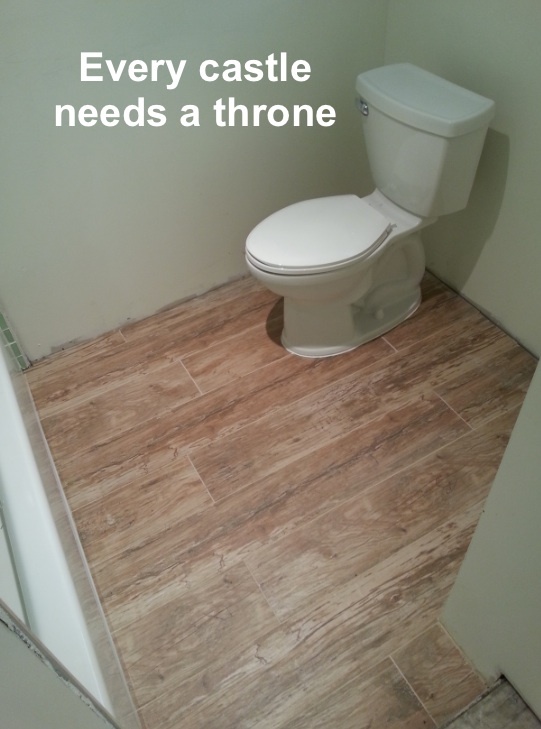 While new tile is great and all, the truly under appreciated star of the bathroom is the toilet. 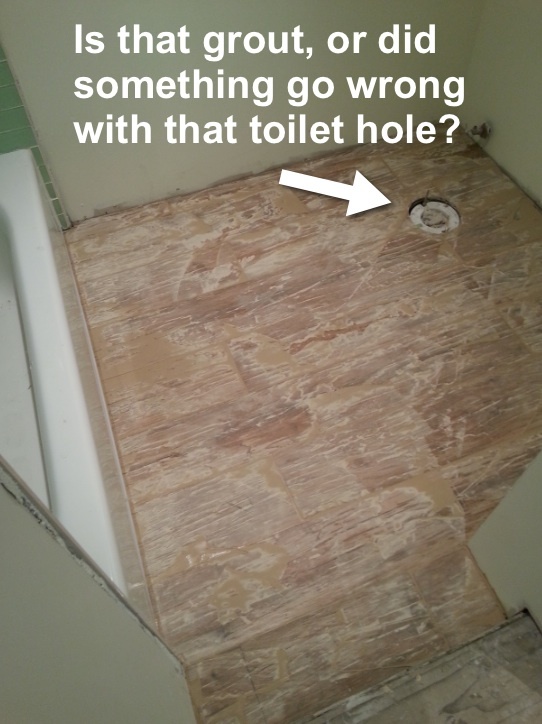 Once the floor tile was ready to be trampled all over, I wasted no time having my plumber come out and finish installing the shower head, nozzle, drain, and yes…the toilet. 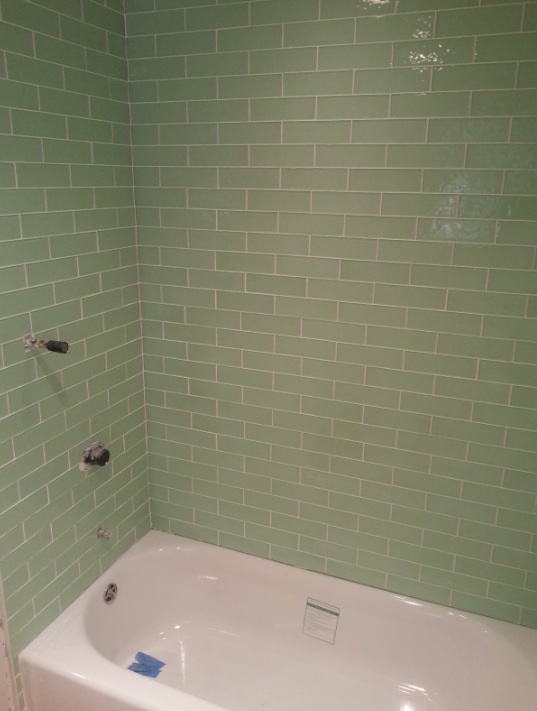 The bathroom is almost done. I still need a vanity and a shower door (along with a bit of molding), but now its time to shift my focus back into the main room. 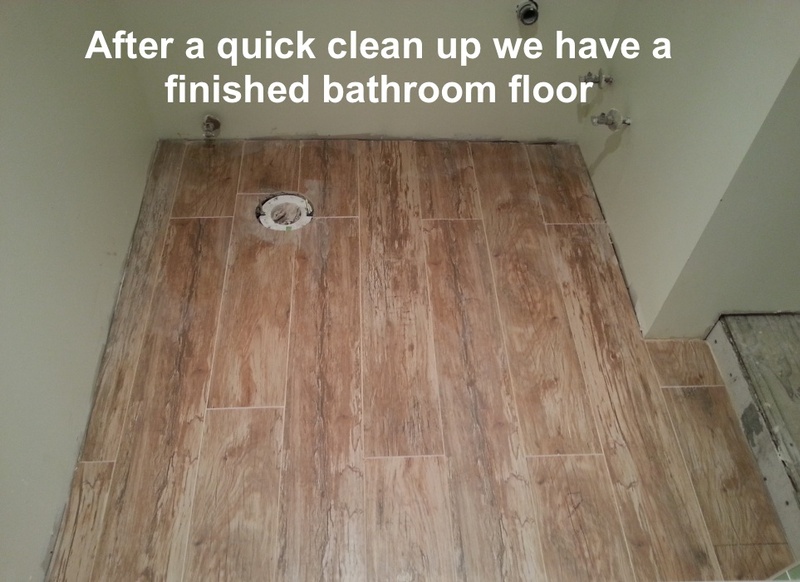 Stay tuned for my upcoming post on flooring! Hi Everyone! Wow, it feels like it’s been months since I posted to Building With Beth! 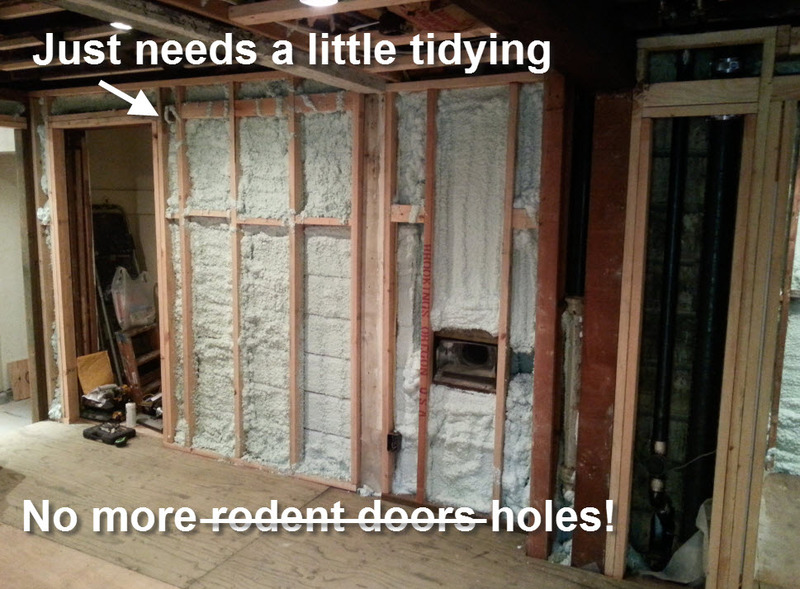 You see, renovating a home is not entirely unlike going to the gym. At first you’re all fired up and ready to prove your mastery of gravity against those weight machines. After working hard for a while, however, sometimes you simply hit a plateau, making it harder to keep up the routine. 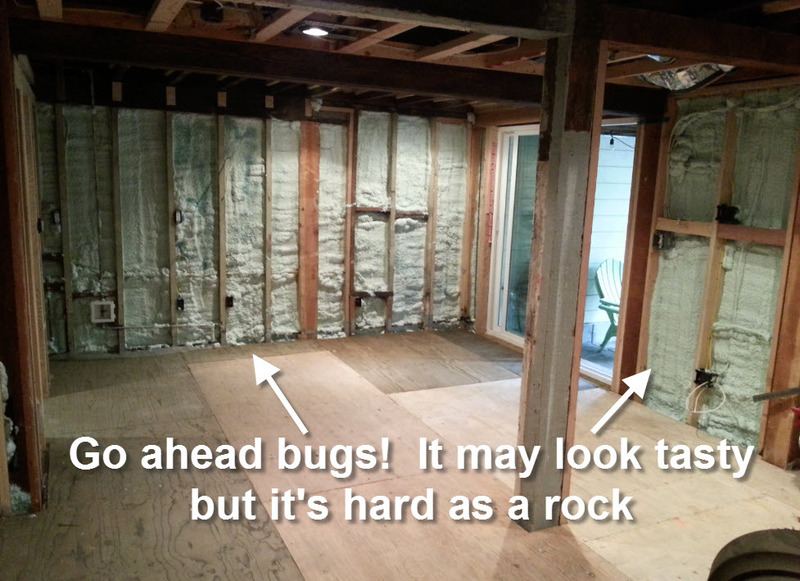 In the case of my home renovation project, I can say that I literally hit a wall! Well, maybe “hit” is too strong a word. 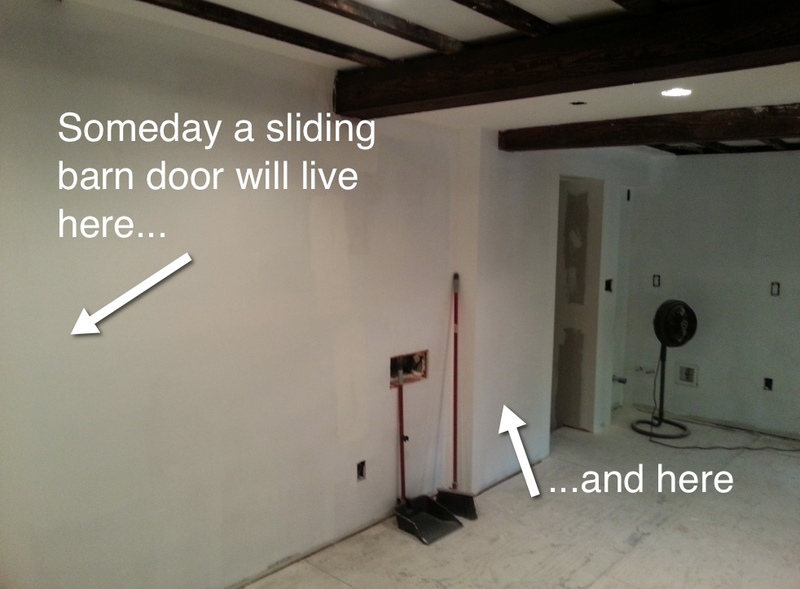 I sanded a wall, over & over & over! 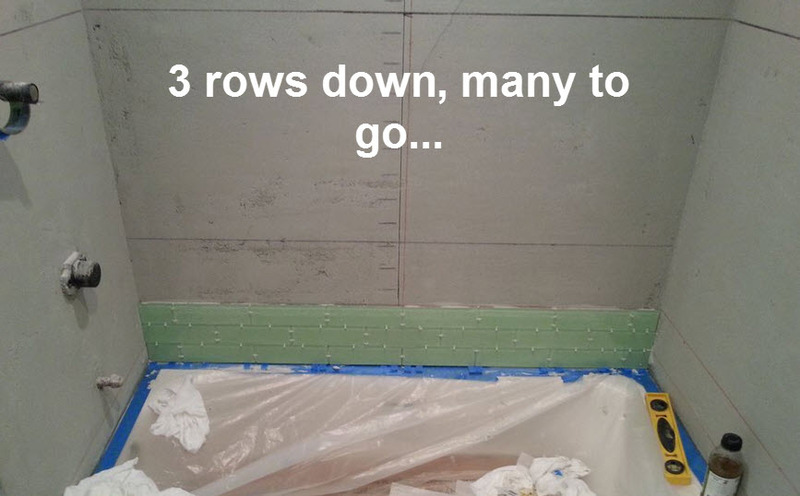 That’s right, it’s drywall time! Of course, after their work was done my work began. Picture Ralph Macchio in the Karate Kid as a 6’2” tall female DIY’er sanding a wall rather than waxing a car. 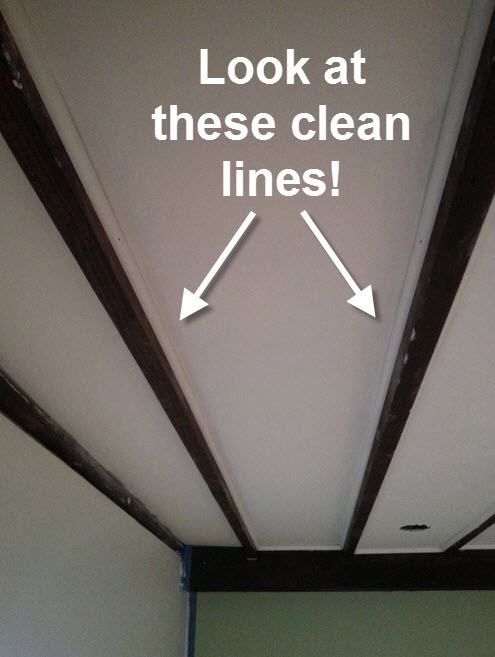 The drywall finishing process is the main reason why you haven’t seen a post from me in awhile. 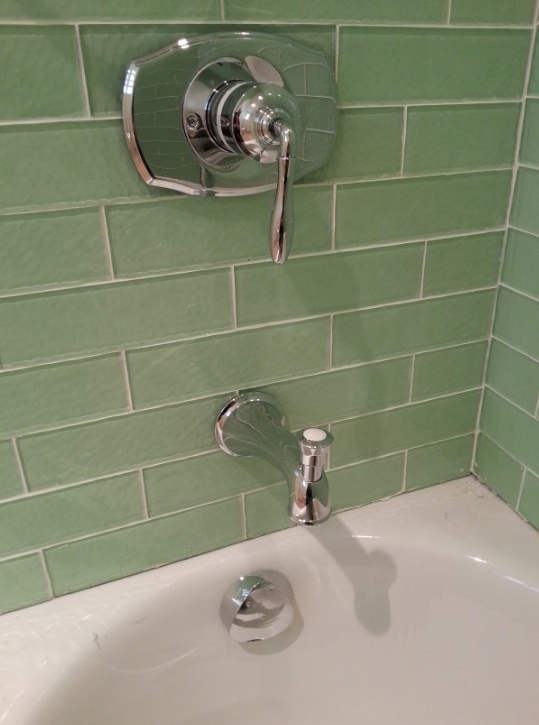 What took three guys one day to install, took me nearly two months to finish. With that said, the feeling of pure satisfaction when it was all done made the whole process feel worth it! 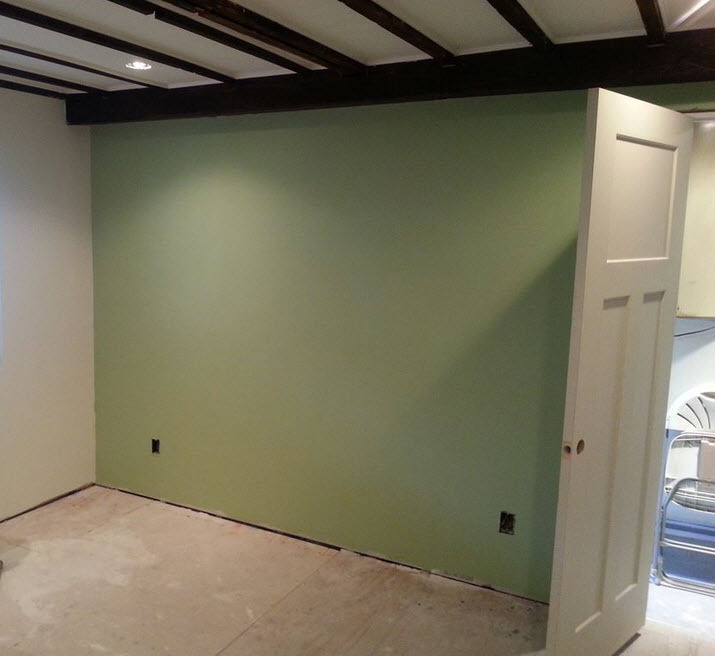 AND, now the walls are ready for primer! 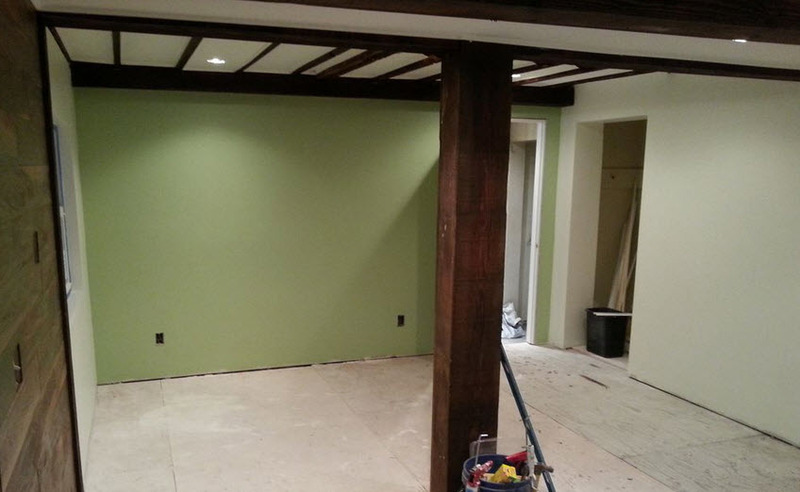 Now, with the room all ready for paint, it is time to focus my attention on the various wooden accents in the room. 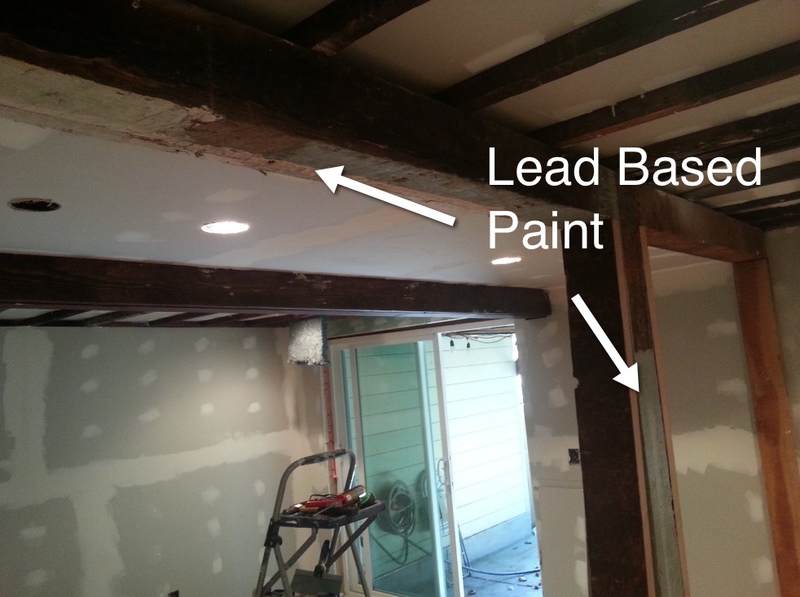 A while back I tested the paint on the column and beam that is the center of the room. 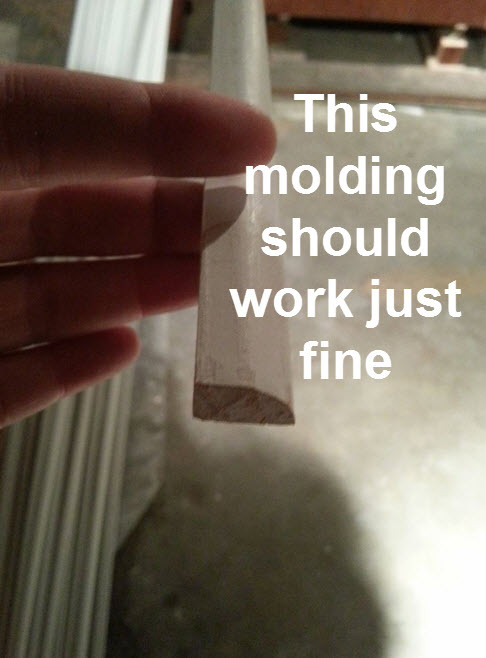 Unfortunately, it came back positing for lead. Since I want to keep the rustic feel of the exposed, well-aged wood, I decided to wrap the column & beam in some reclaimed barn wood I got at the local lumber yard. 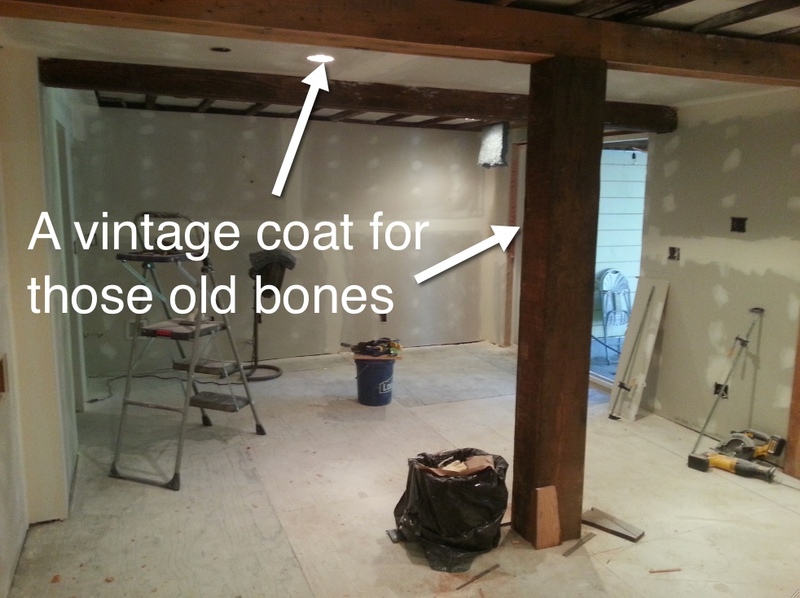 I like to think of it as putting a nice warm coat on the old bones of this house. 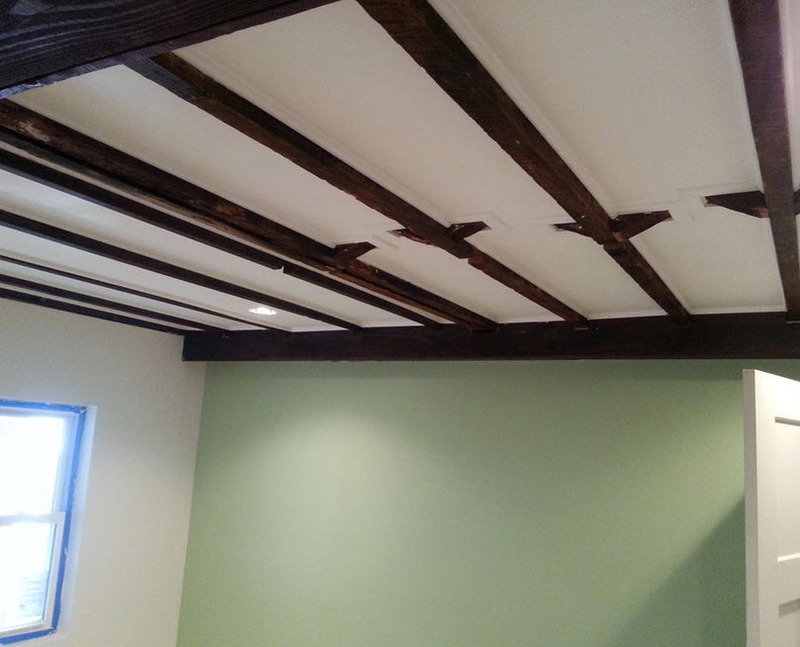 Once the reclaimed wood was put in place, I stained the lighter wood to match the dark color of the older wood in the room. 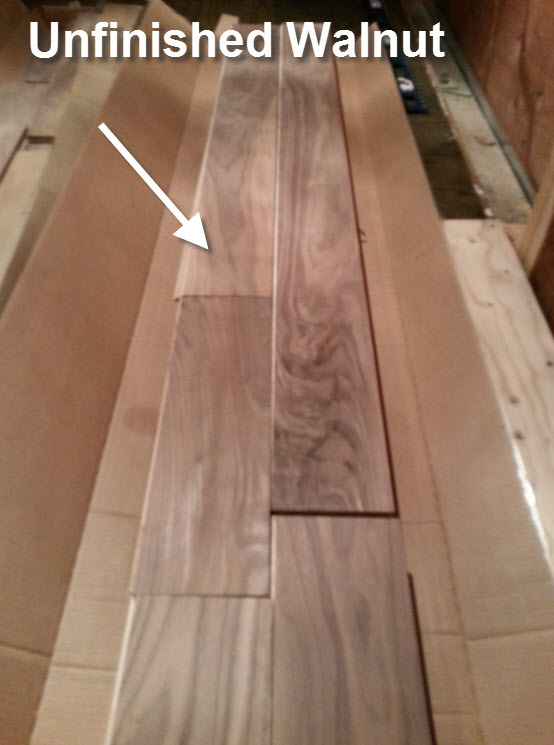 Now, you might recall in my Whats Next post awhile back I mentioned picking up a couple of boxes of beautiful walnut flooring at the local salvage yard. 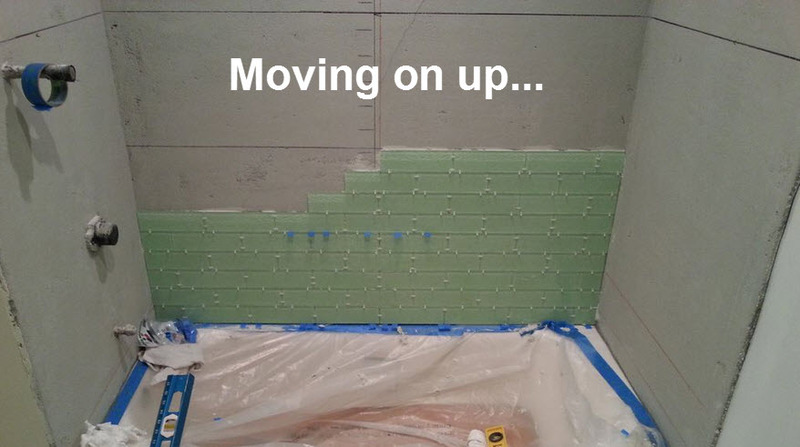 Now that the drywall is up it’s time to make it look pretty. 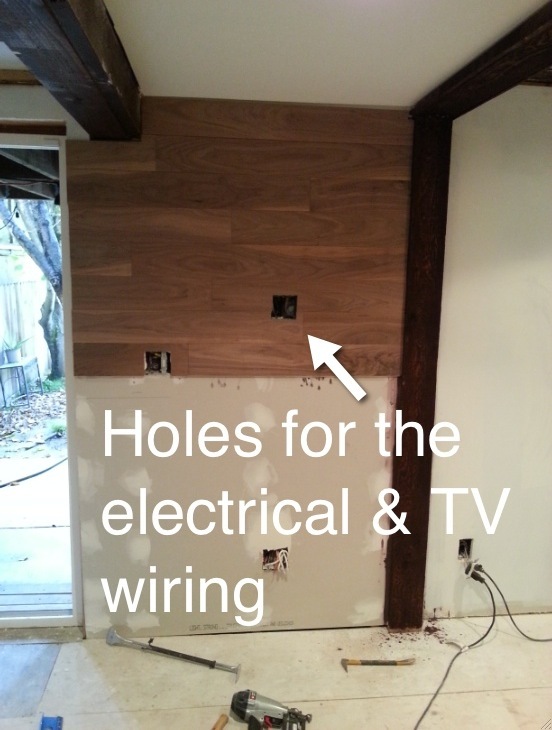 I didn’t have much walnut to work with, but I had enough for an accent wall behind where we will be mounting the television. 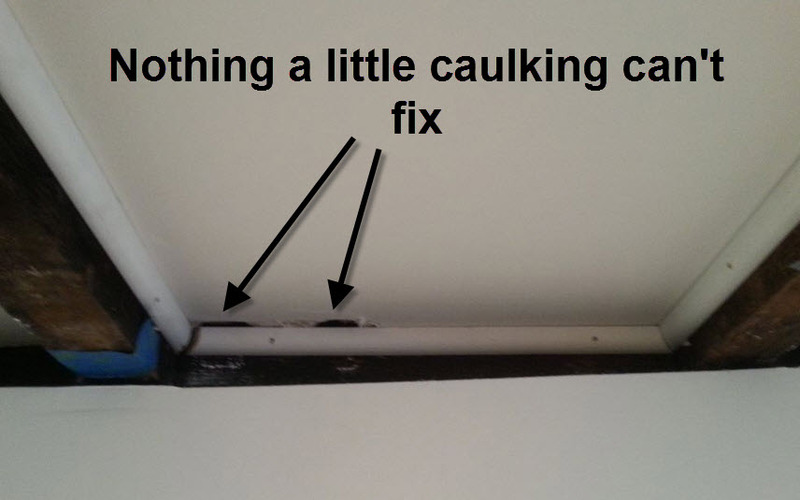 Using my trusty finishing nailer and some construction adhesive I staggered the boards down the wall. 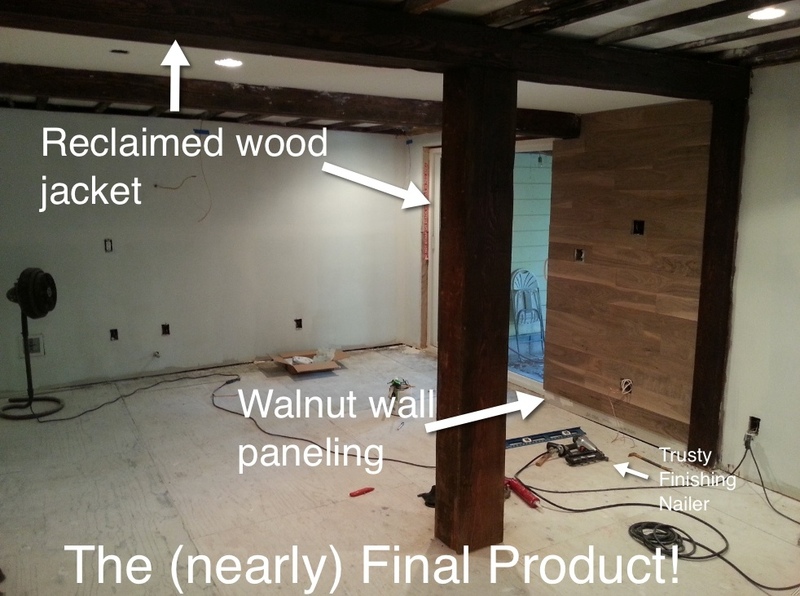 Between the drywall, the walnut accent wall and the beams wrapped in reclaimed wood, this former barn-like space is starting to really look like a warm and cozy room! I still need to sand the walnut so it’s smooth and cover it in a protective finish, but this accent wall is already classing things up! Phew! I covered a lot in this post, but stay tuned for more on finishing this In Law unit! 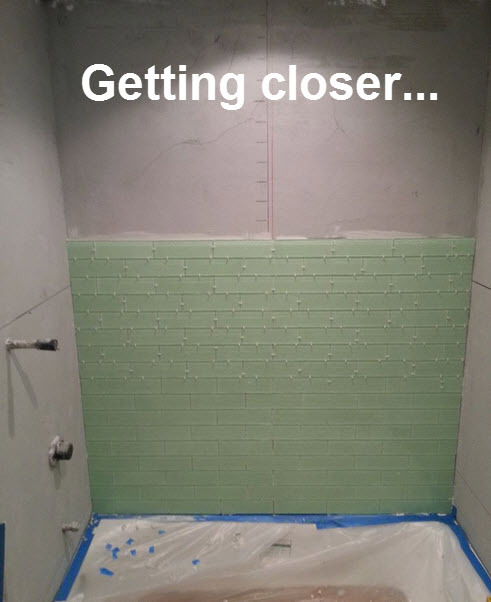 Things are coming together. Now that I’m officially an adult, I occasionally find it challenging to feel that youthful unrestrained exuberance in the little things like I once did. At my ripe old age of 37 you probably wont catch me popping wheelies on my BMX or blowing bubbles in my milk. With that said, there’s always room for exceptions. 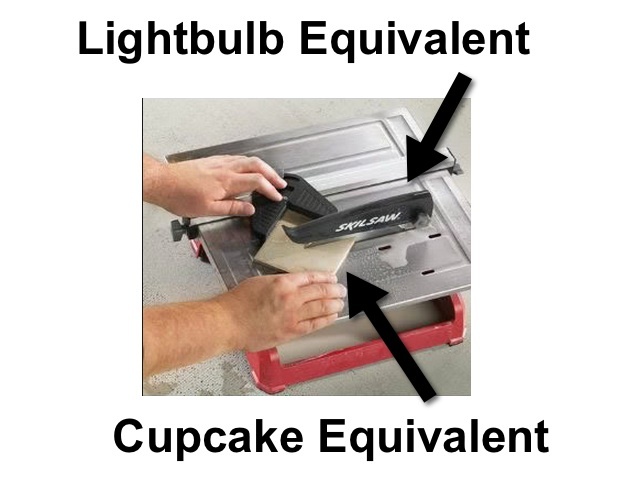 Take whipped cream for example. If you stick a whipped cream container in my hand you could bet money that the next thing you’ll see is my mouth so full of whipped cream that its oozing out my nose. That’s right. When it comes to whipped cream, go big or go home! 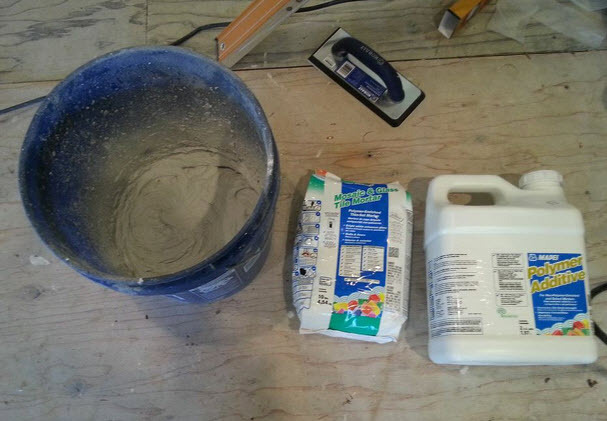 Now you might be wondering what whipped cream has to do with home renovation. You see, I’m at that point in my project where the dry rot has been repaired, the windows have been installed, the wiring is in place and the plumbing is ready for some flushing! 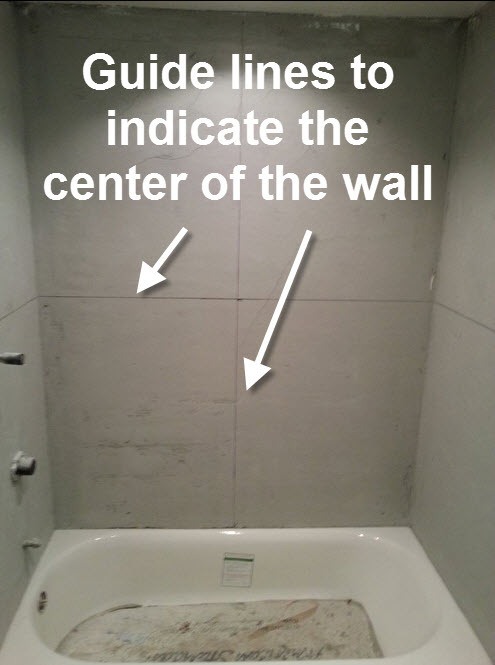 Therefore, there is only one step left before drywall can be installed. That’s right, it’s time to spray foam! 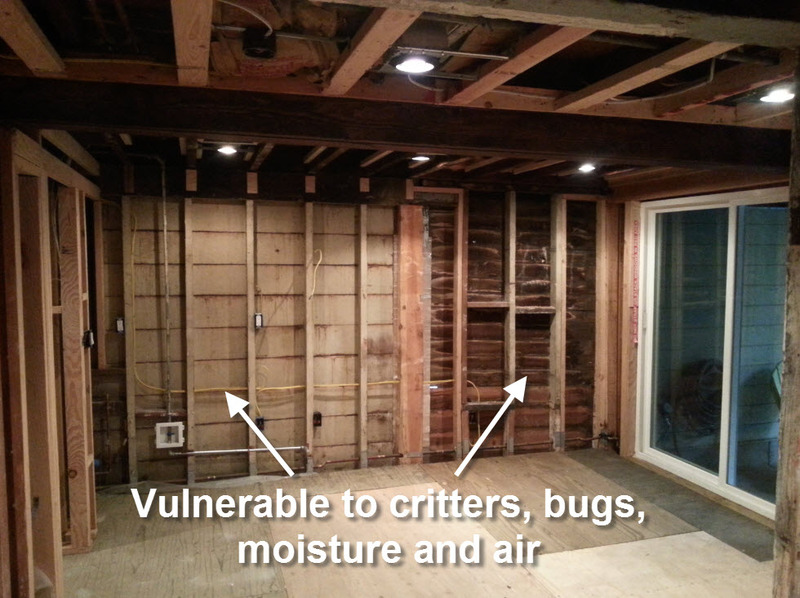 As many of know, the walls in the In Law unit are not resistant to bugs, critters, bandits, cold air or moisture. Frankly, it’s almost like your camping but without the warmth and security of a tent. 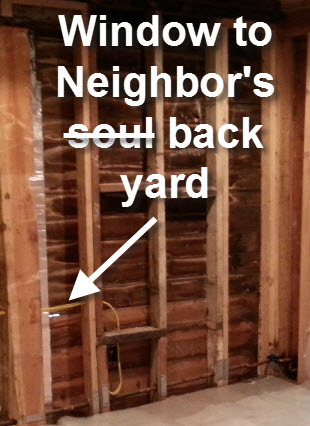 You can actually see my neighbors back yard through some of the spaces between the siding. 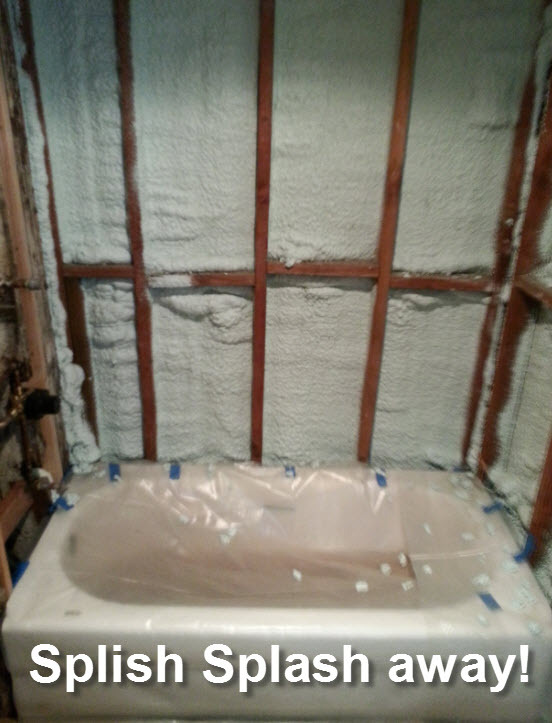 After doing my DIY research, I have decided to insulate the In Law unit using closed cell spray foam. I mean, think about it. This spray foam keeps bugs out, keeps critters out, keeps moisture out, keeps warm air in, AND it looks just like whipped cream! The choice was a no brainer. 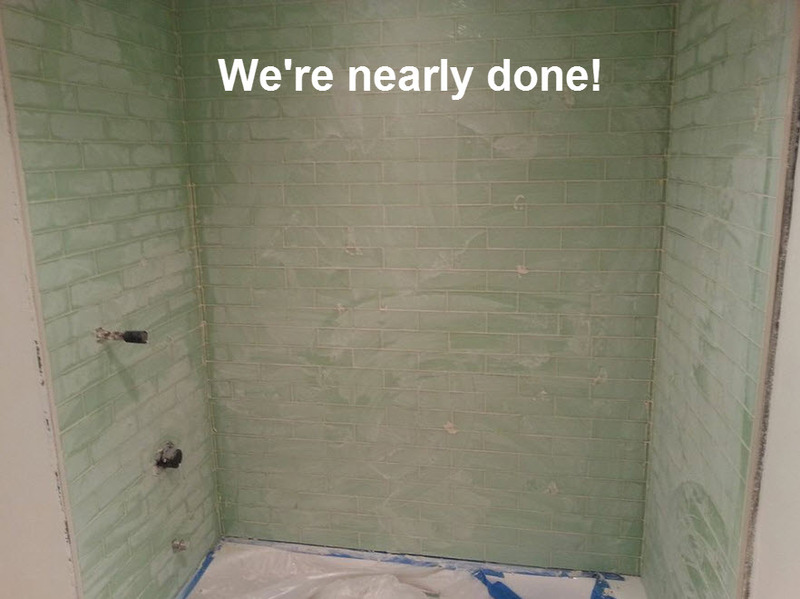 I’ve actually been giddily awaiting this moment since this renovation project began! I get to fill my walls with whipped cream a whipped cream like substance! It’s like a dream come true. Plus, I get to wear this stylish and functional body suit. Between the giant canister of whipped cream foam, the body suit and the risk of the unknown, it’s almost like I’ve walked into a 1980’s rave! 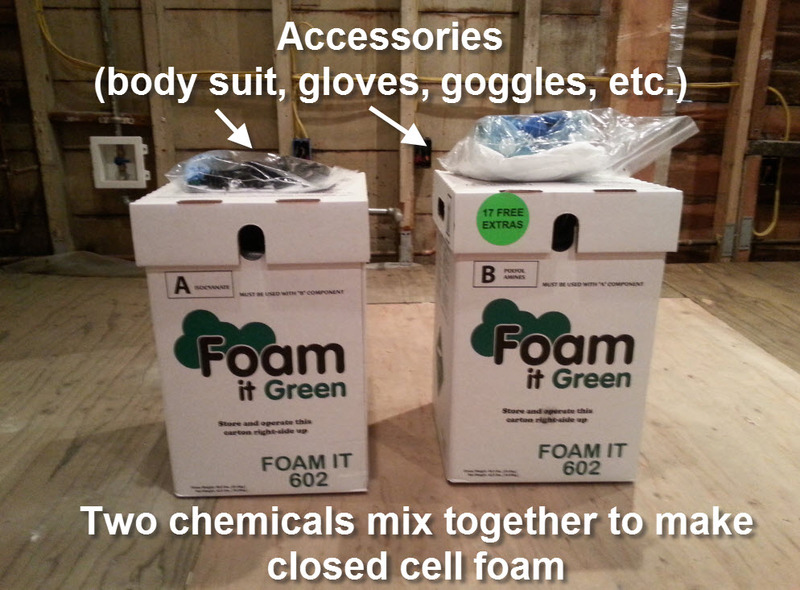 I decided to go with the “Foam It Green” DIY spray foam kit. 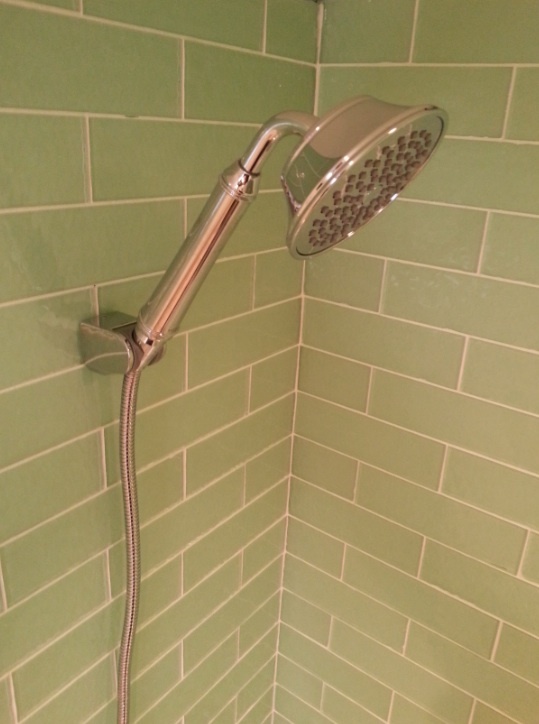 Based on the reviews and videos, this product seemed like the best choice and the easiest to use. 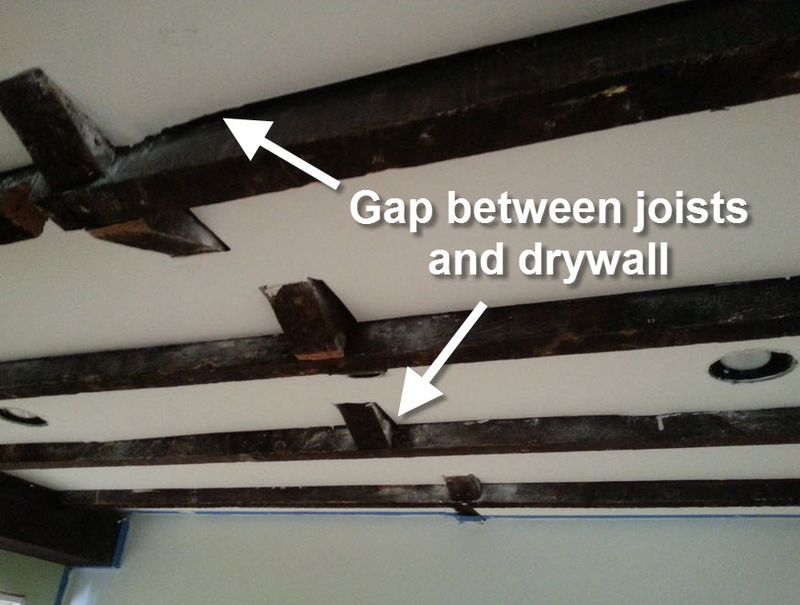 Beyond all of the benefits that I’ve already mentioned, this spray foam also hardens really fast and acts as an additional structural support. Frankly, with so many different functions, there’s a side of me that wants to see how far this product will go. 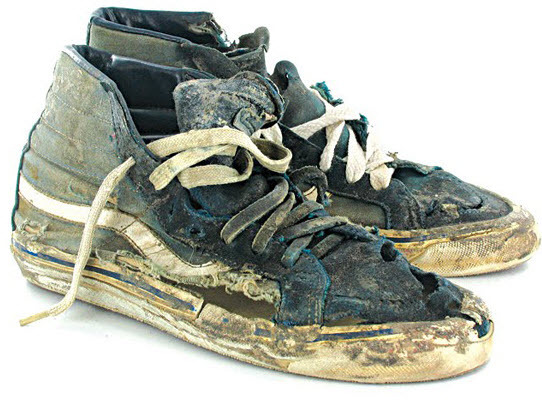 Could I cover myself in spray foam and then float gingerly down a river? Or, better yet, could cover my entire car in spray foam and turn it into a boat-car? 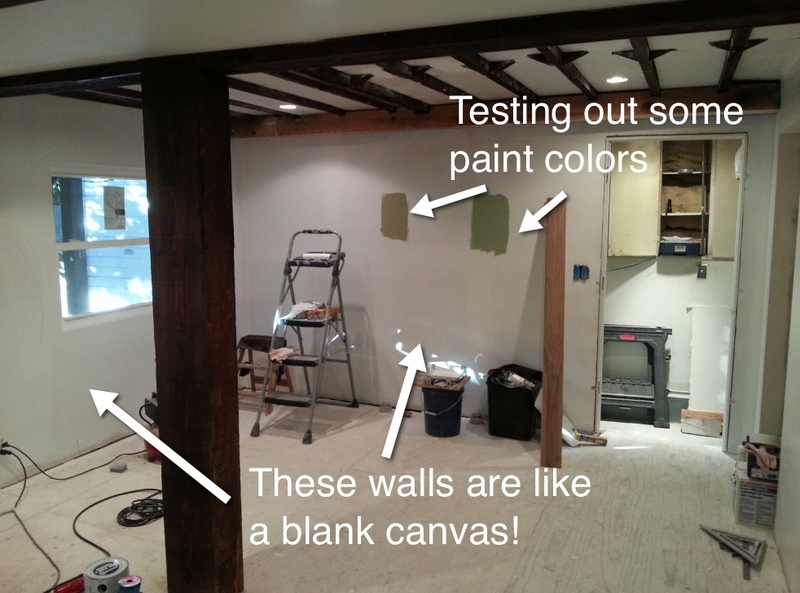 I see endless possibilities for experimentation, but I need to stay focused on the task at hand! Disclaimer: Now there is something worth mentioning regarding spray foam that doesn’t seem to be very well covered on any websites. Despite the fact that the foam looks like a lovely blending of whipped cream and sea-foam, you do not want to eat it, breathe it, or get it on your body in any way. 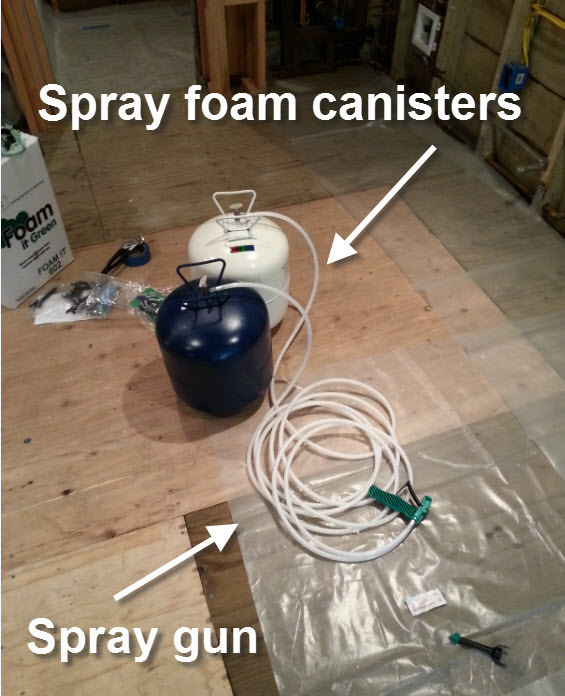 The point of spray foam is to expand and plug holes so air cannot get through. 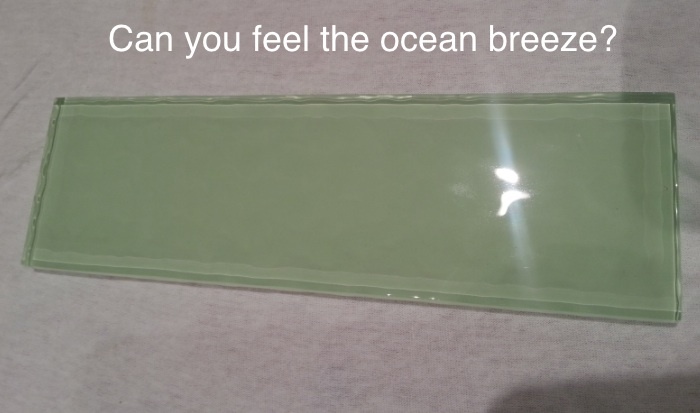 If you think about it, this is the opposite purpose of your lungs. 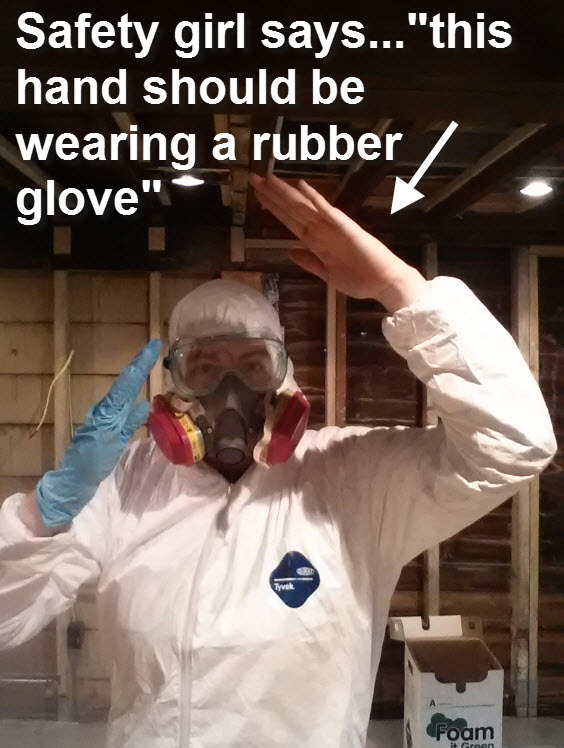 If you do not want to create an air and moisture barrier inside your body, make sure to ware the respirator at all times. From a topical standpoint, this stuff sticks and does not come off easily. Frankly, if I got this in my hair I might do one of two things. I’d either shave my head, or I’d cover my head entirely in spray foam and pretend its a hat. This is why I’m covered from head to toe in the Foam It Green suite. Now that I’m geared up, I’m ready to get this party started! 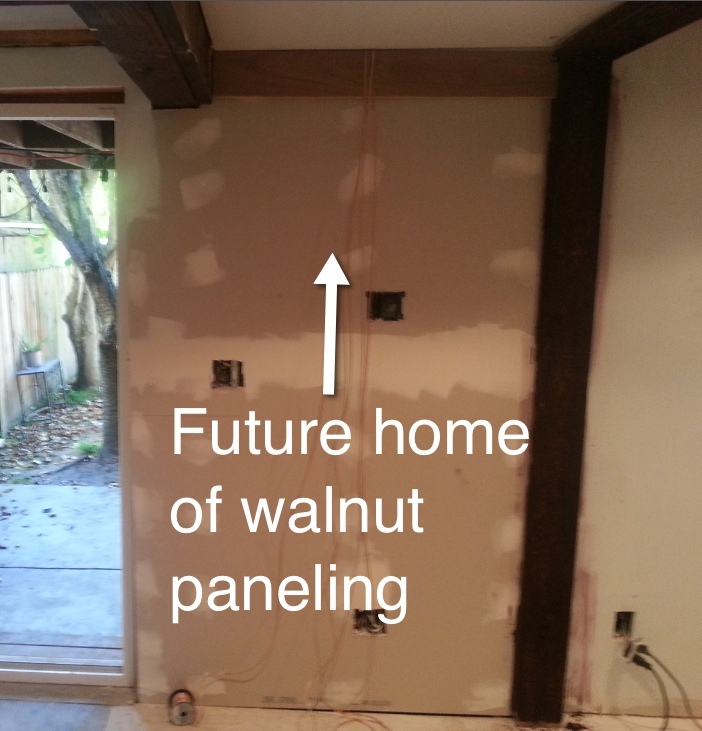 The plan is to try to focus first on the external facing walls. Check out my film debut below where I show installation process in fast forward! I was shocked, but the 600 square feet of foam that I purchased actually ended up covering every wall of the In Law unit. 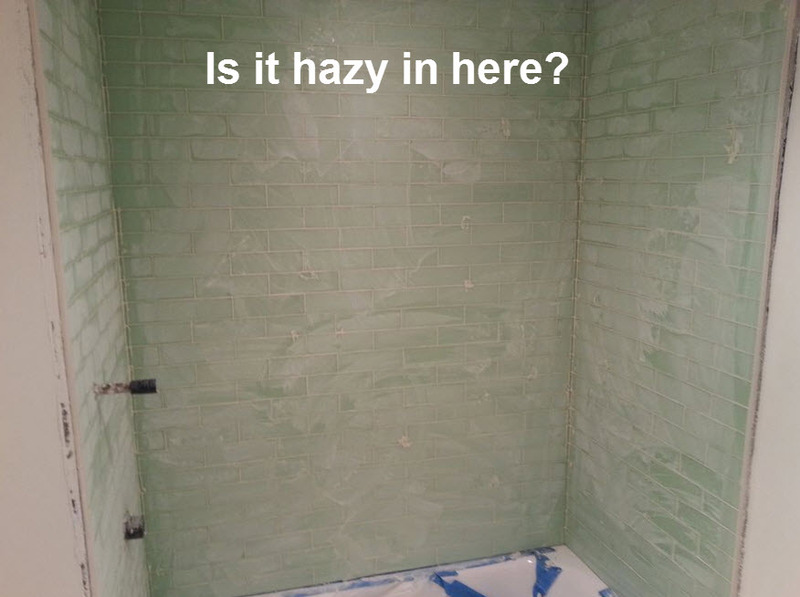 The spraying was actually really easy. If you were to use this product I’d offer two pieces of advice. 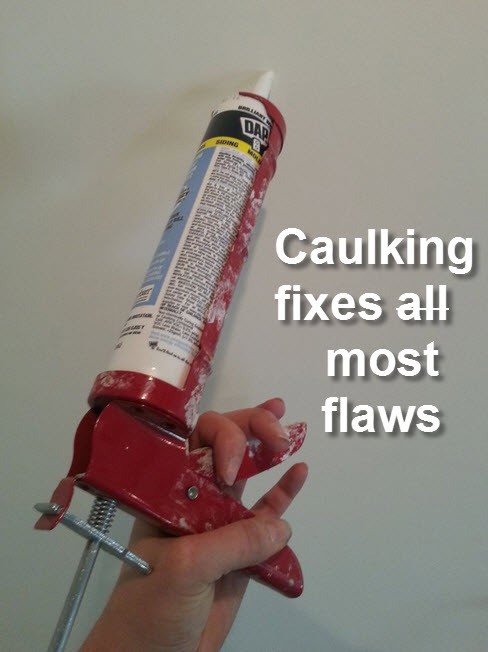 1) Change the mixing nozzle on the spray gun frequently. They give you a ton of nozzle “mixing” heads because they get clogged when you stop spraying, so you should change them out regularly. 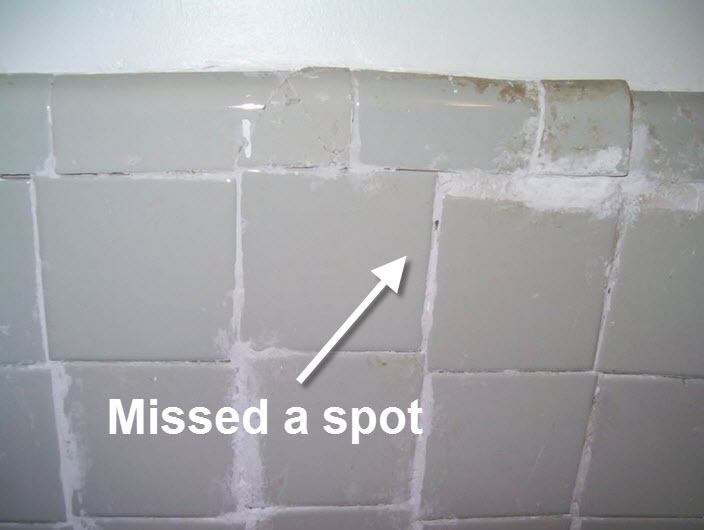 2) I found that starting from the bottom of the wall and working up worked best for me. Sometimes when I went top-down, the foam would have a hard time sticking and would drip to the ground. 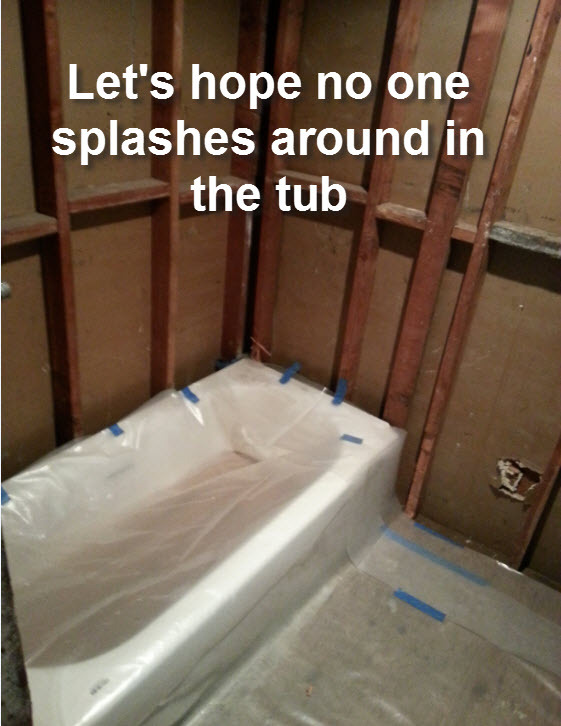 When I went bottom-up, the foam sort of stuck to itself and made things much easier. 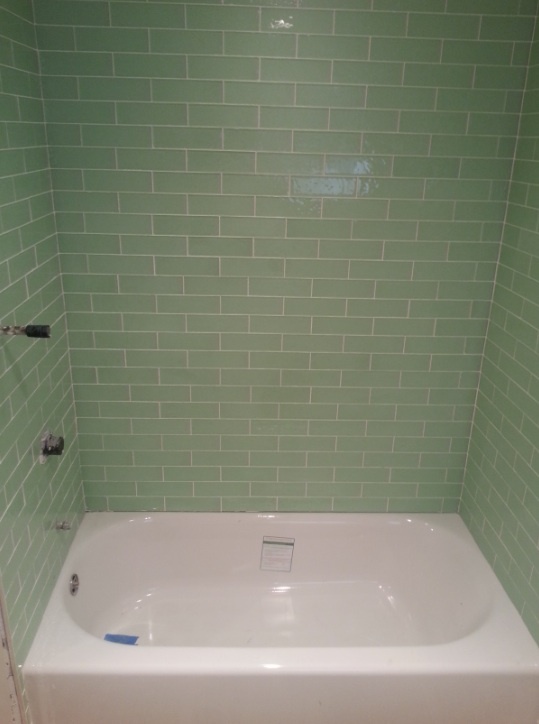 Check out the Before and After pictures below. 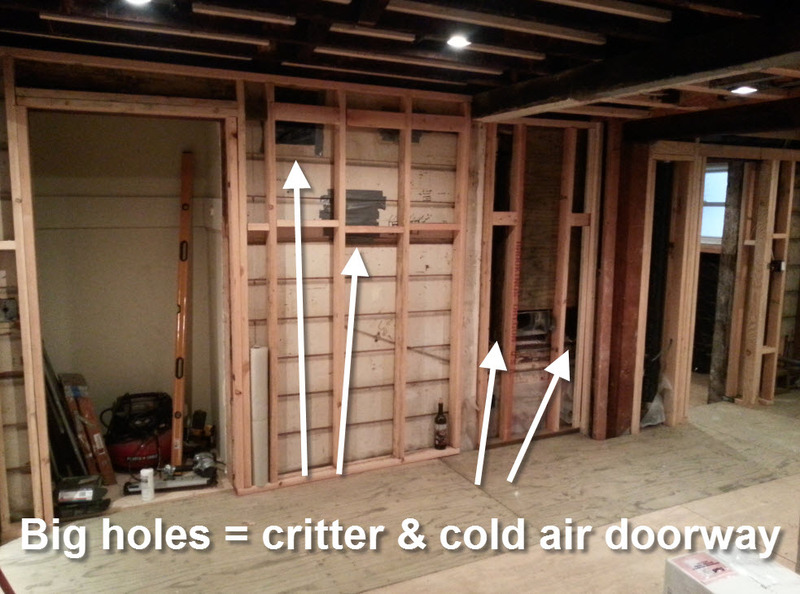 With every wall insulated, it’s time to move onto drywall! This is a huge step for this project and I can’t wait to share it with you all! Stay tuned.